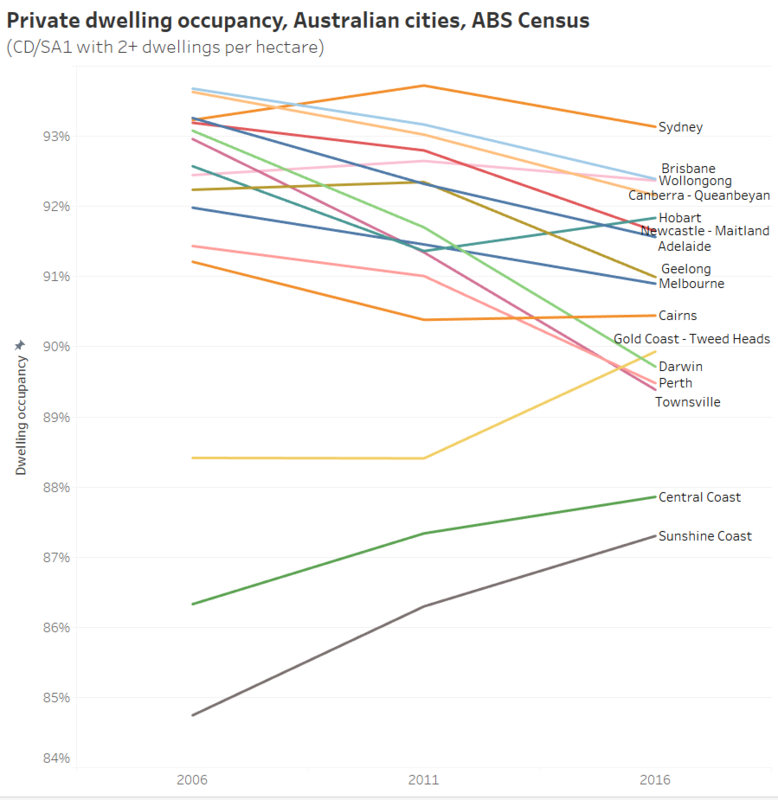 According to census data, private dwelling occupancy has been declining in most Australian cities (refer my earlier post on the topic). Could an increase in private dwellings dedicated to Airbnb rental – but vacant on census night (a Tuesday in winter) – explain much of this decline? Let’s look at the data. 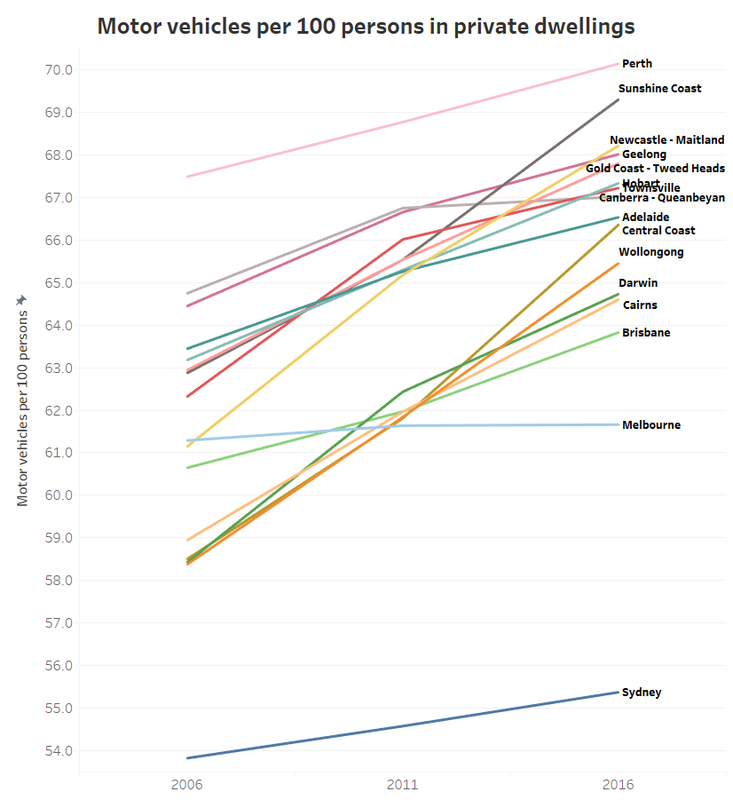 Firstly here’s a reminder of private dwelling occupancy trends in Australia’s 16 largest cities. 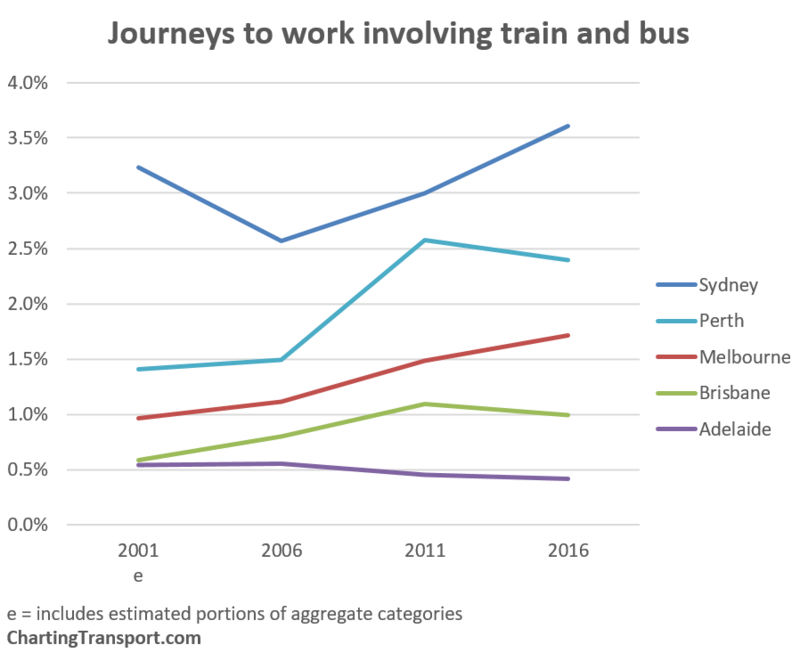 Dwelling occupancy rates declined in all large cities (but rose in some smaller urban areas, particularly on Central (NSW), Sunshine, and Gold Coasts). The ABS have advised me that their field officers would have no way of telling whether a dwelling is on Airbnb, and would therefore count them as private dwellings. So vacant Airbnb dwellings could account for unoccupied private dwellings. How many of the additional unoccupied dwellings might be dedicated to Airbnb? The fantastic site Inside Airbnb provides data scraped from the Airbnb website about listings in various cities. I’ve used available data extracted on 4 September 2016 for Melbourne and 4 December 2016 for Sydney (the closest data sets available to the August 2016 census). I’ve then filtered for entire home/apartment listings that had more than 90 days availability in the 12 months ahead and had been reviewed at least once in the last six months, to estimate the number of “active and dedicated” Airbnb dwellings. Definitely just an estimate. 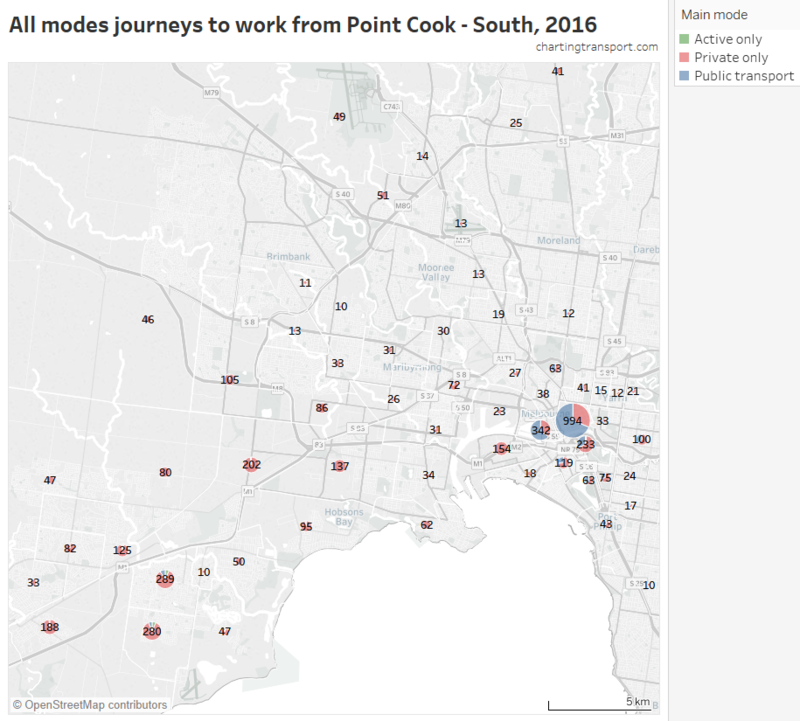 For the area for which Melbourne Airbnb data is available (I’ve approximated Inside Airbnb’s unpublished boundary as SA3s with any listings in 2016) these Airbnb dwellings account for 0.19% of total private dwellings. For that same area, dwelling occupancy dropped 0.71% from 92.61% to 91.90% between 2011 and 2016. 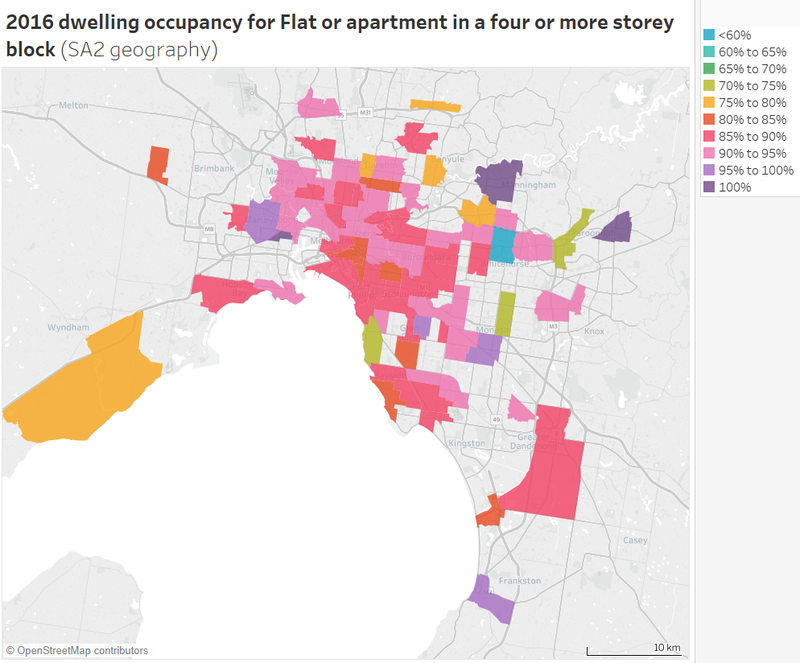 According to a Melbourne University study using data from commercial Airbnb data site AIRDNA, around 62% of entire home/apartment Melbourne listings (that were not blocked out by owners) were unoccupied on Saturday 27 August 2016. I’m guessing the Airbnb vacancy rate might have been higher on census night (a Tuesday). If say 70% of the Airbnb dwellings were empty on census night (just a guess), then they would account for 0.09% out of the 0.71% decrease in dwelling occupancy in Melbourne between 2011 and 2016, which is about 19%. Note: Airbnb barely existed in Melbourne in 2011 – there were only 161 Airbnb listings. 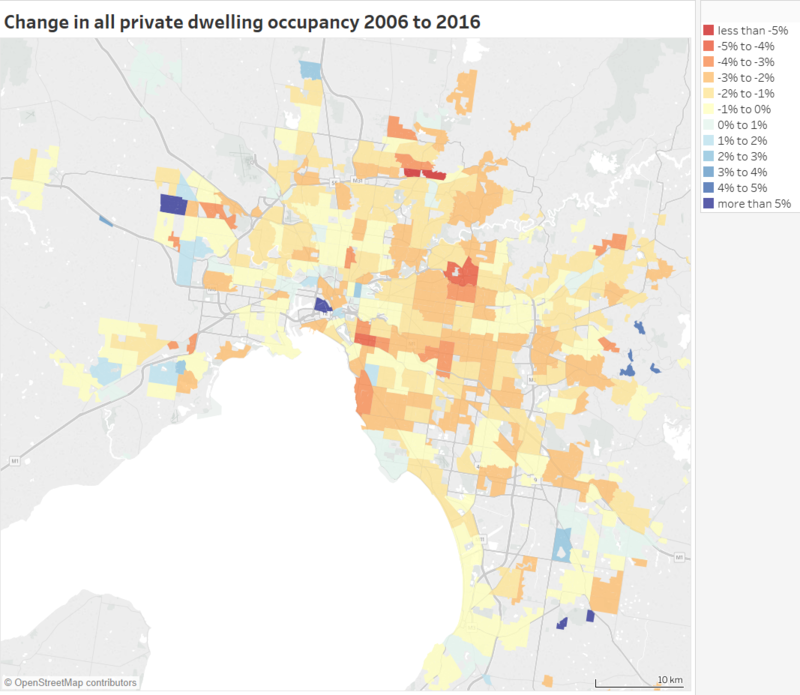 If somewhere between 60% to 80% of active/dedicated Airbnb properties were vacant, then they might explain between 16% and 21% the decline in dwelling occupancy in Melbourne. 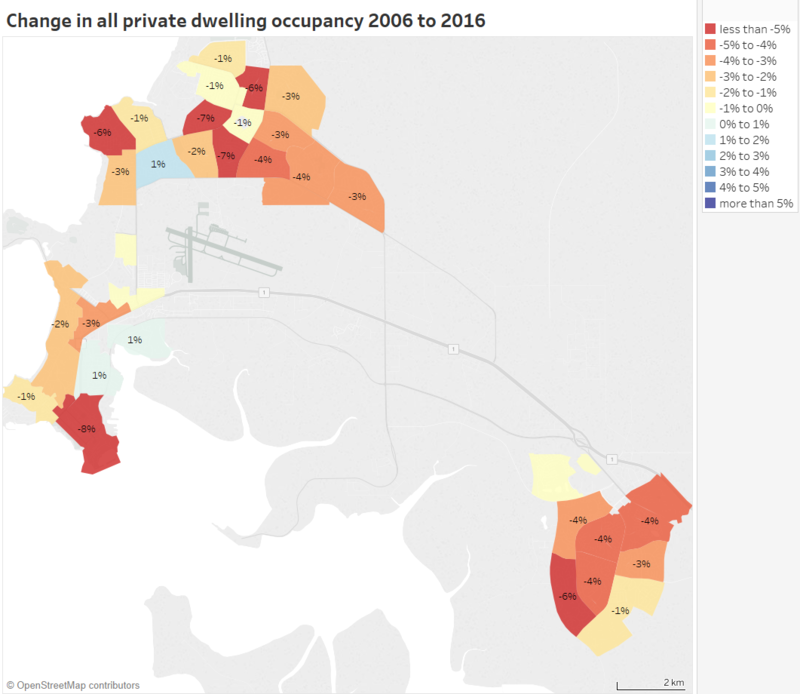 For the equivalent area of Sydney, these Airbnb dwellings account for 0.22% of private dwellings, and there was a drop in private dwelling occupancy of 0.58% between 2011 and 2016. If somewhere between 60% to 80% of active/dedicated Airbnb properties were vacant, then they would explain between 23% and 30% of the decline in overall dwelling occupancy. It’s possible that some of these “entire home/apartment” listings are not counted by the ABS as dwellings (eg granny flats or segmented buildings that don’t have separate addresses) which would lead to over-estimates. Some Airbnb listings that have less than 90 days availability in the 12 months ahead might just be very popular – leading to underestimates (my guess is that is unlikely). The Sydney figure might be an overestimate because the Airbnb data was extracted three months after the census, and the total number of Airbnb listings almost doubled in 2016. The actual Airbnb vacancy rate on census night might not have been in the 60-80% range. I don’t know exactly where the city boundary was drawn for the Inside Airbnb data, but my approximation is more likely to be larger – which would lead to slight underestimates (probably very slight as the differences would be in peri-urban areas with few dwellings). There may be other reasons – please comment. That said, it looks like Airbnb might explain somewhere in the order of a fifth of the drop in private dwelling occupancy in Melbourne and Sydney between 2011 and 2016. Certainly not all of it, but probably not none of it either. 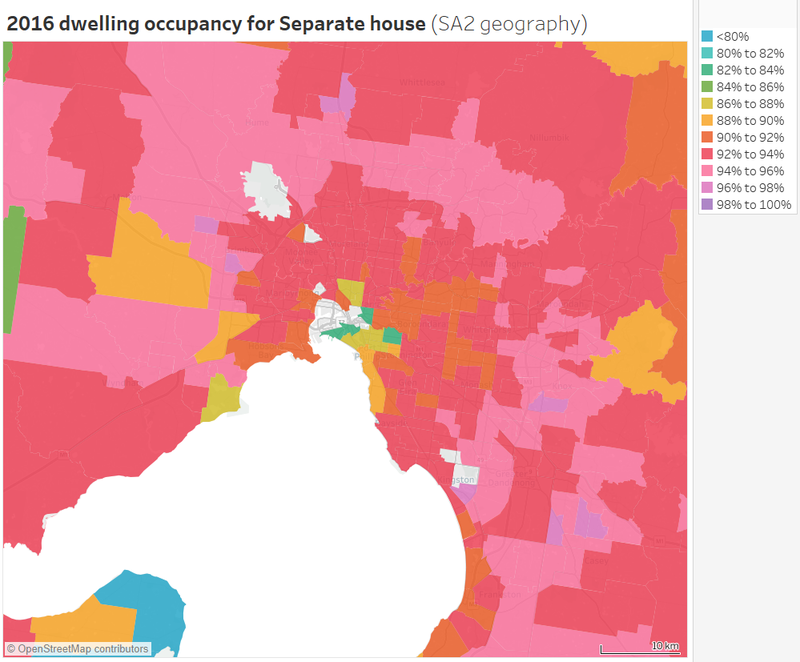 What proportion of dwellings are dedicated to Airbnb in different parts of Melbourne and Sydney? 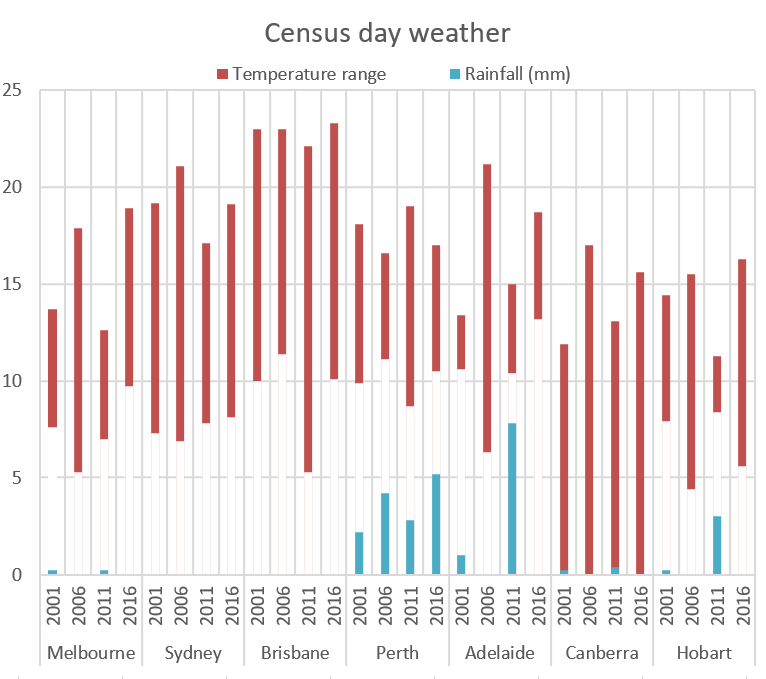 It maxes out at 2.5% in the Melbourne CBD (that’s 1 in 40 dwellings), followed by Southbank and Fitzroy at around 1.9%. Mount Dandenong – Olinda is the orange patch to the east which measures 1.3%. View the data in Tableau. 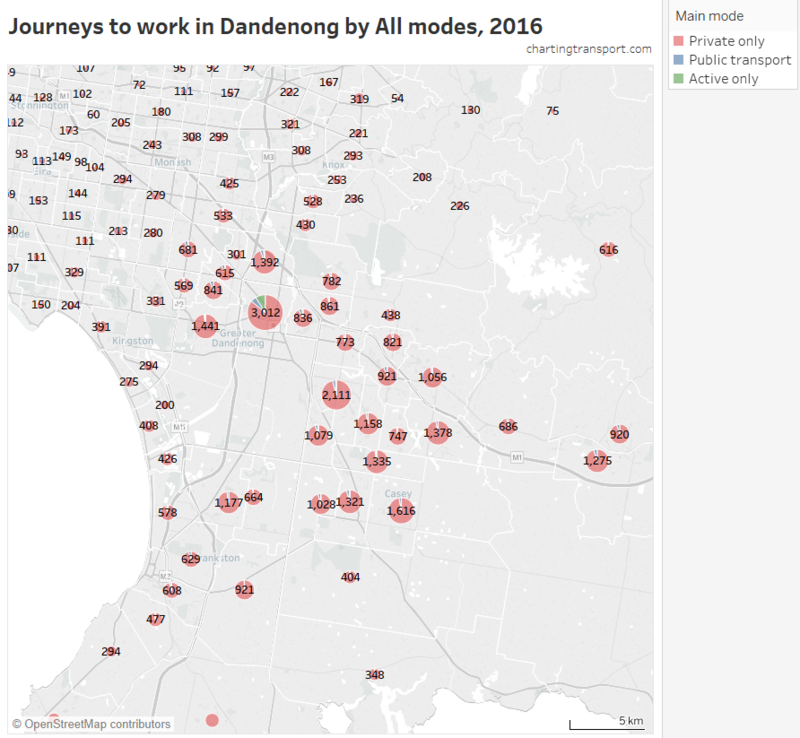 As you would expect, Airbnb properties appear to be more prevalent around the inner city and tourist areas (eg St Kilda and the Dandenongs). These are also the areas with generally lower dwelling occupancy, and certainly some of the unoccupied dwellings in the census will be Airbnb dwellings. The highest rates are 2.6% around Bondi Beach, and 2.5% at Avalon – Palm Beach. 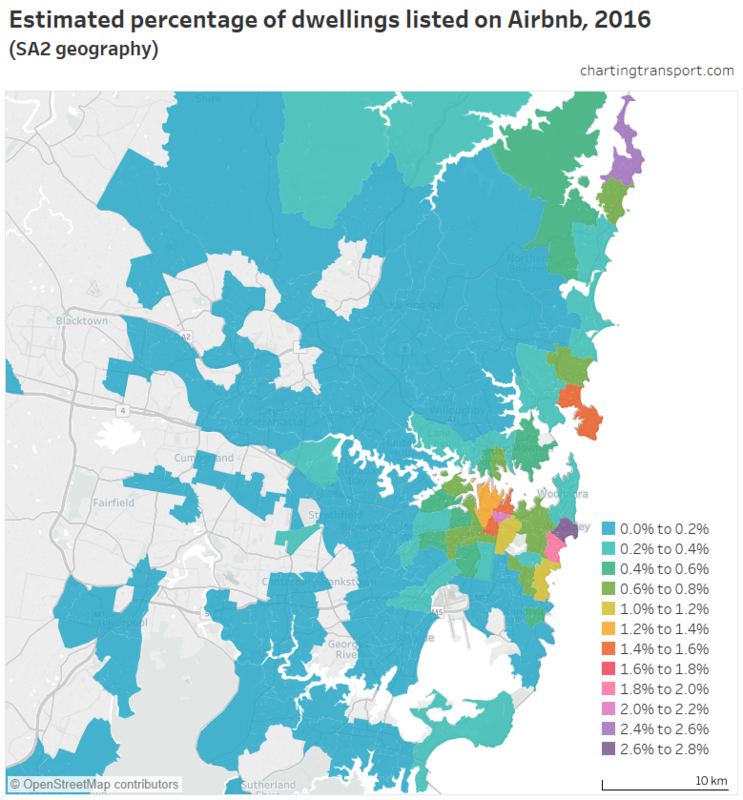 Manly comes in at 1.5%, Surry Hills is 1.5%, Potts Point – Woolloomooloo is 1.4%, while the CBD area is 1.3%. Again, you can explore this Airbnb data in Tableau. Could Airbnb properties explain the spatial differences in dwelling occupancy? 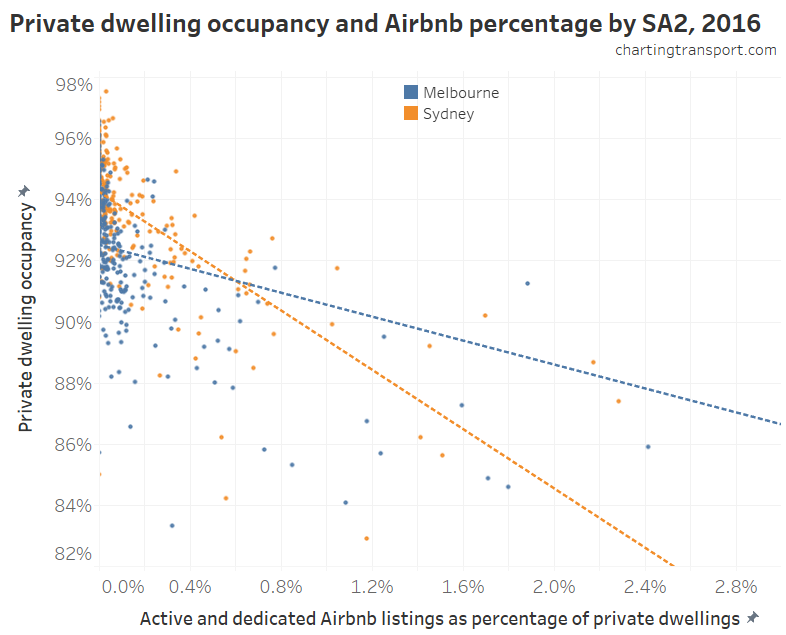 Here’s a plot of dwelling occupancy and Airbnb percentages for SA2s in Melbourne and Sydney. 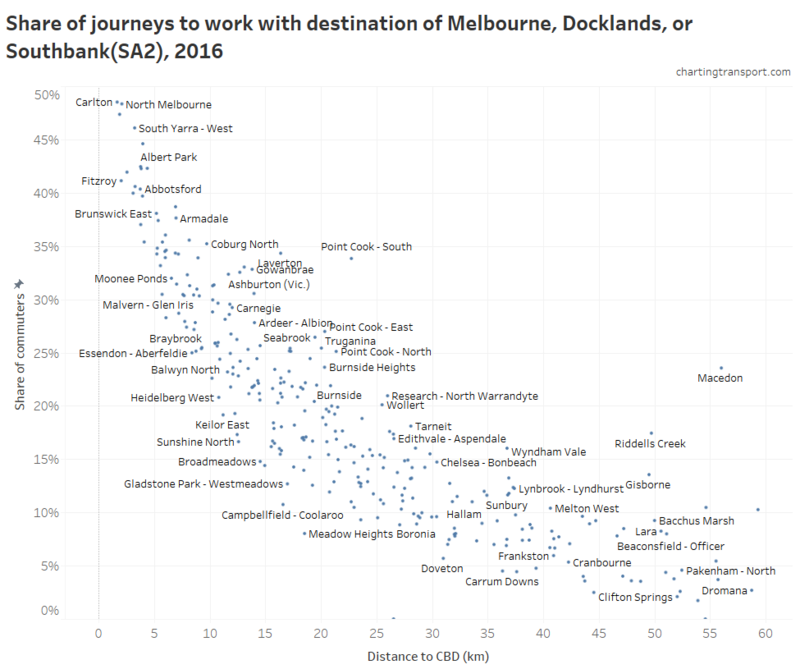 I’ve done a linear regression on each city, and while the relationships are significant, they are not strong, and the correlation coefficients are -4.9 in Sydney and -1.5 in Melbourne. The signs are as expected (ie more Airbnb, lower occupancy), but the magnitudes are much higher than would be the case if Airbnb was the main explanation for lower dwelling occupancy (otherwise they would be around -1 or smaller). Which essentially means Airbnb presence is correlating with other drivers that would explain lower dwelling occupancy. 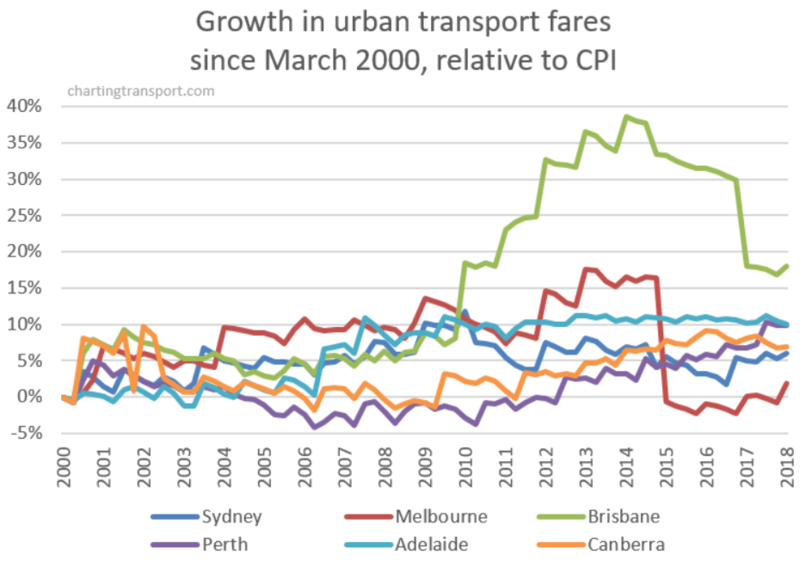 Indeed inner city and tourist areas had lower dwelling occupancy in both 2006 (when Airbnb didn’t exist) and 2011 (when Airbnb only had a tiny presence in Australia). Therefore I think we can conclude Airbnb properties are more prevalent in areas where dwelling occupancy is lower for other reasons – one of which is likely to be popular places for visitors. Unoccupied Airbnb properties are almost certainly part of the pattern, but cannot explain the majority of the decrease in dwelling occupancy. Can you do those Airbnb maps at higher resolution? It’s getting a bit beyond the topic of transport, but yes I can go down to SA1 level. It’s not particularly important, but certainly interesting. A disclaimer: Airbnb introduce randomised errors on property locations of up to 150 metres, so there will be some mis-attribution of properties to SA1s, but hopefully not too much. Also, I’m still only counting properties that match the above criteria. Airbnb maxes out at 11% for three city blocks around Swanston Street and Collins Street, plus a large SA1 in East Melbourne that actually only contains a small residential area close to the CBD (including an apartment tower at 279 Wellington Parade). There’s also an SA1 in Southbank behind Crown Casino that is 10% Airbnb. Curiously, there were only about 6 Airbnb listings in the New Quay apartments in Docklands that had 65-70% occupancy (refer earlier post), so Airbnb is definitely not to blame of the low occupancy of those towers. Outside the central city, other hot spots are St Kilda around Acland Street (6%), just east of South Yarra Station (6%), and a patch of Olinda (5%). Explore in Tableau. It tops out at 11% in the southern part of the CBD, with 10% in part of Pyrmont and 7% in pockets near Manly and Bondi Beach. Other hotspots include Coogee (6%) and Whale Beach further north (5%). Explore in Tableau. 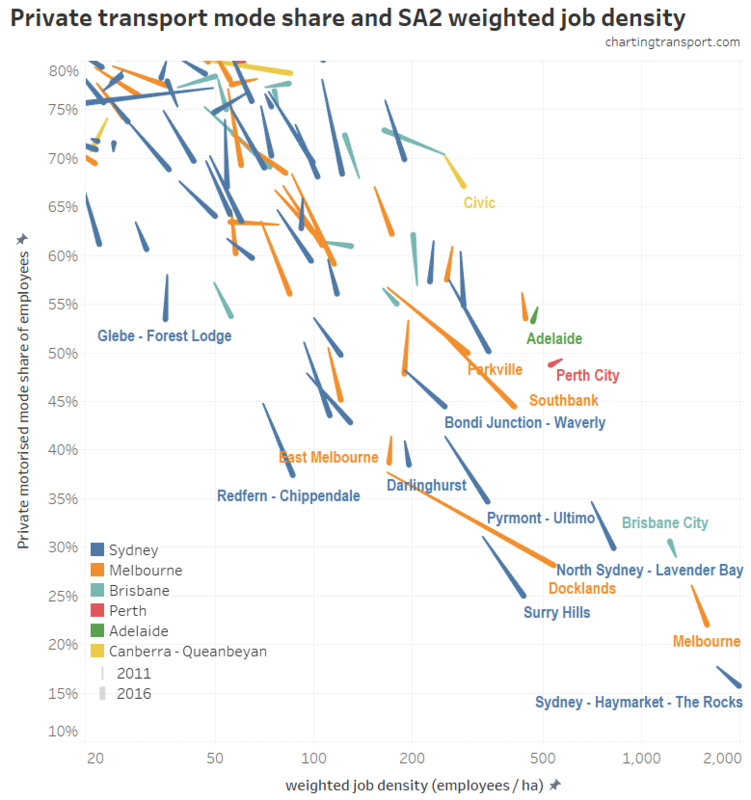 Where are the unoccupied dwellings in Australian cities? Over one million private dwellings in Australia were unoccupied on census night in 2016 – 11.2% of all private dwellings – up from 10.2% in 2011. This raises many questions. Where are these unoccupied dwellings and where are they now more prevalent? What type of dwellings are more likely to be unoccupied? How long have these dwellings been unoccupied? Do we know why these dwellings are unoccupied? This post will focus on dwelling occupancy by geography, dwelling types and trends over time. In a future post I hope look into those last two questions in more detail. 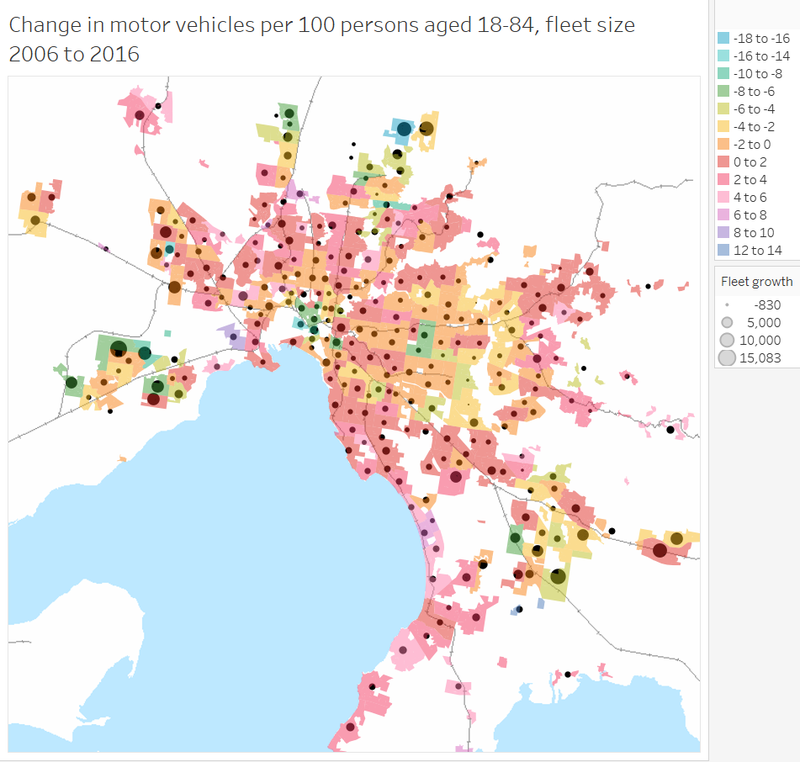 I’ve prepared data for sixteen Australian cities, with various maps in Tableau (you will need to zoom and pan to your city of interest). 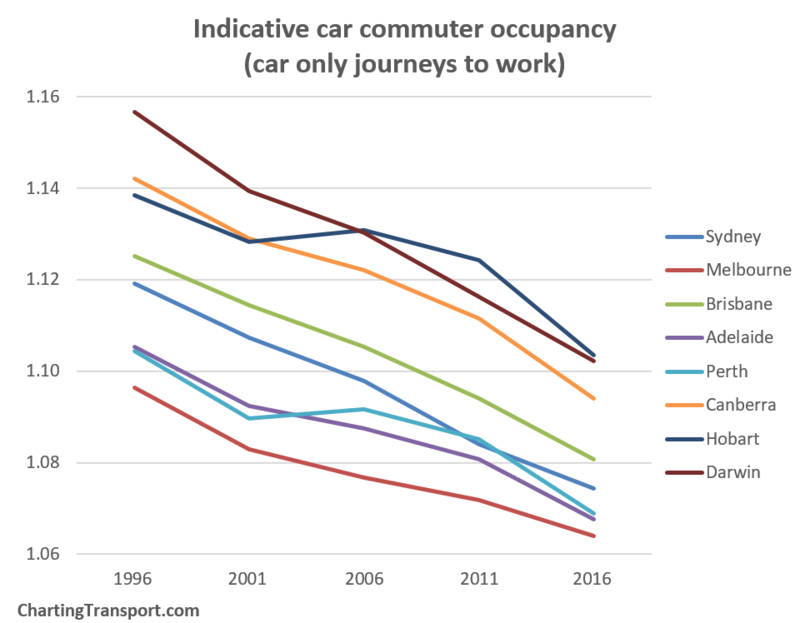 Why am I blogging about dwelling occupancy on a transport blog? 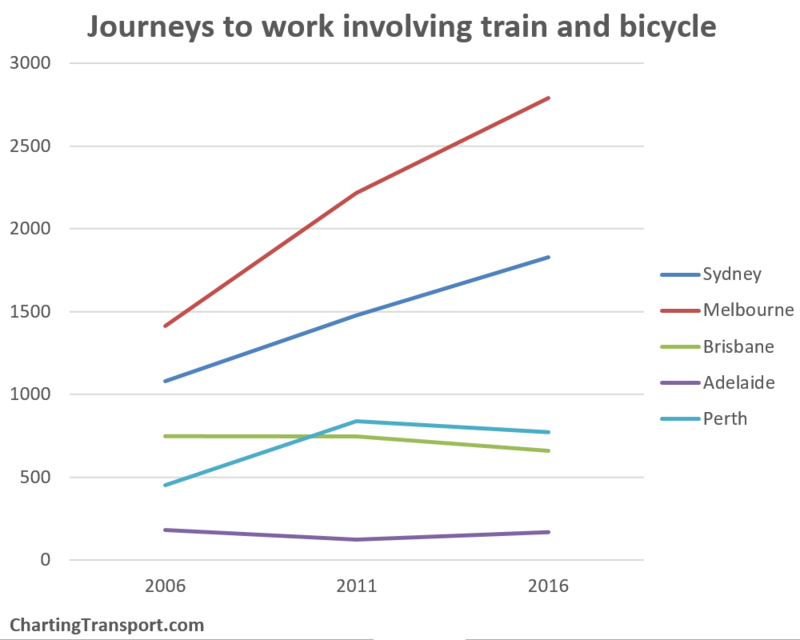 Well partly because I’m interested in urban issues, but also because land use is very relevant to transport. 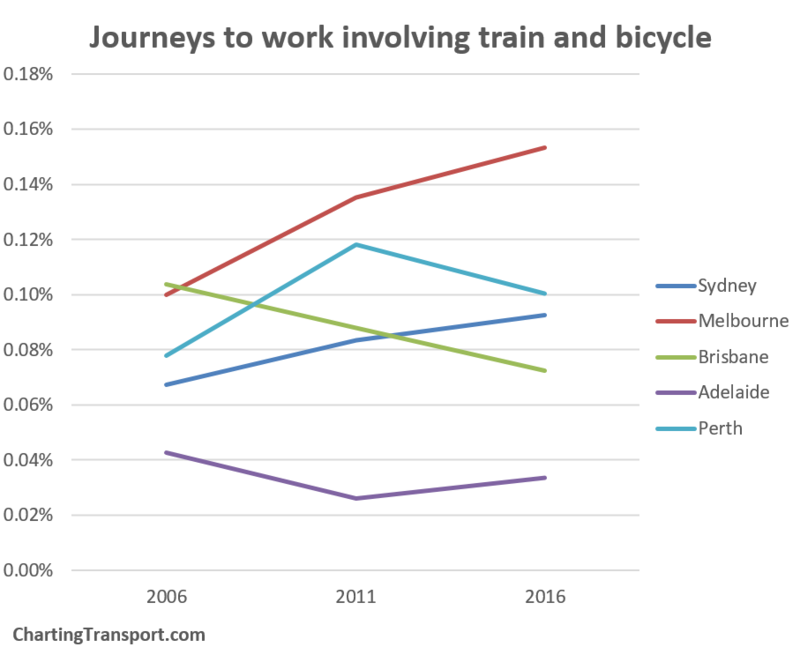 If dwelling occupancy rates in the inner and middle suburbs were higher, there would be more people living closer to jobs and activities who might be less reliant on private motorised transport for their daily travel. If you’d like to read more around the associated policy issues, Professor Hal Pawson from UNSW has a good piece in The Conversation highlighting the increasing number of empty properties and spare bedrooms, and advocates replacing stamp duty with a broad-based land tax to improve housing mobility. Also read Eryk Bagshaw in the Fairfax press, Jonathan Jackson in Finfeed, and a piece in Business Insider where the Commonwealth Bank state that 17% of recently built dwellings are left unoccupied (not sure how that was calculated). 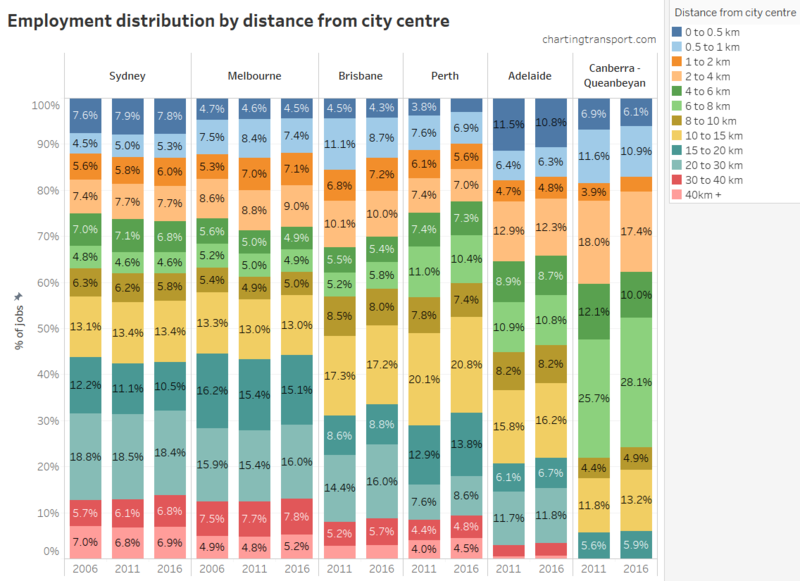 What are the dwelling occupancy rates in Australian cities? Note the y-axis only runs from 84% to 94%, so the changes are not massive. However a small change in dwelling occupancy can still have a large impact on housing prices (rental and sales). The Sunshine and Central Coasts have the lowest occupancy, almost certainly explained by many holiday homes in those regions, although all three have been trending upwards. 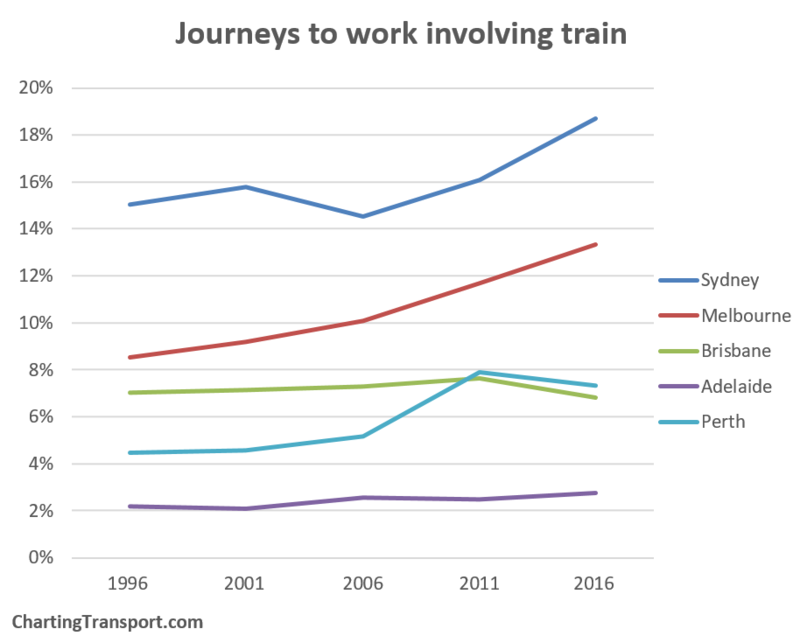 Curiously, the Gold Coast – Tweed Heads had a significant increase in occupancy between 2011 and 2016 to take it above Perth, Townsville, and Darwin. 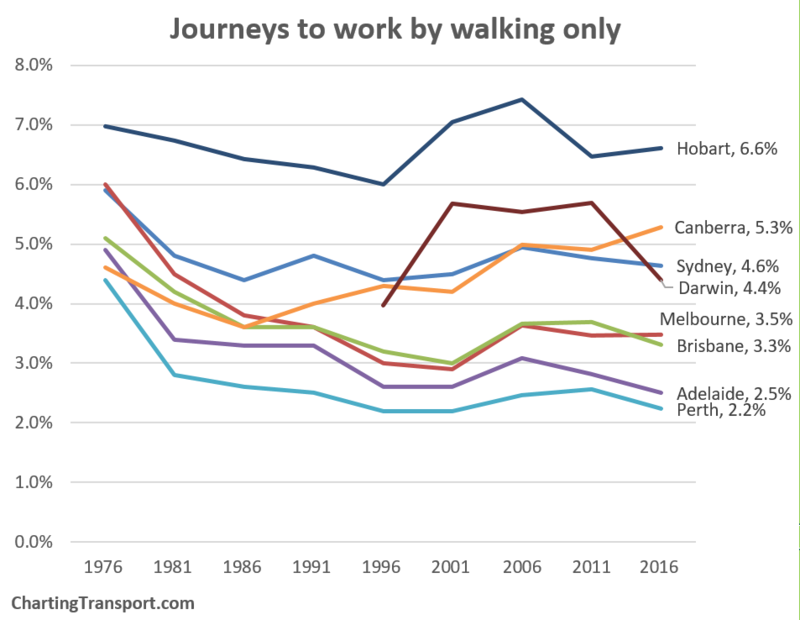 Hobart and Cairns also had increased occupancy between 2011 and 2016, but all large cities declined between 2011 and 2016. 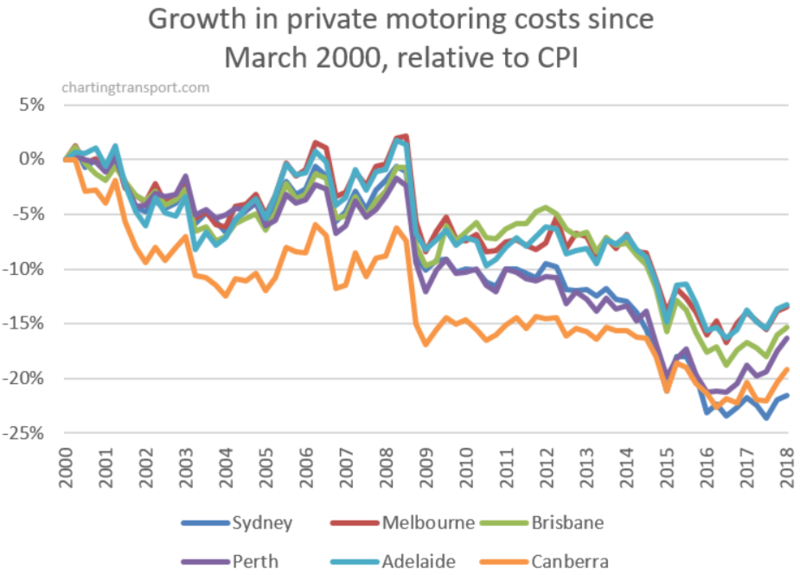 Perth, Darwin and Townsville had big slides – quite possibly related to the downturn in the mining industry and slowing population growth (all three have seen slowing population growth in recent years after a boom period). Then again, if there are more fly-in-fly-out workers in a city you might expect dwelling occupancy on census night to go down as a portion of them will be away for work on census night. 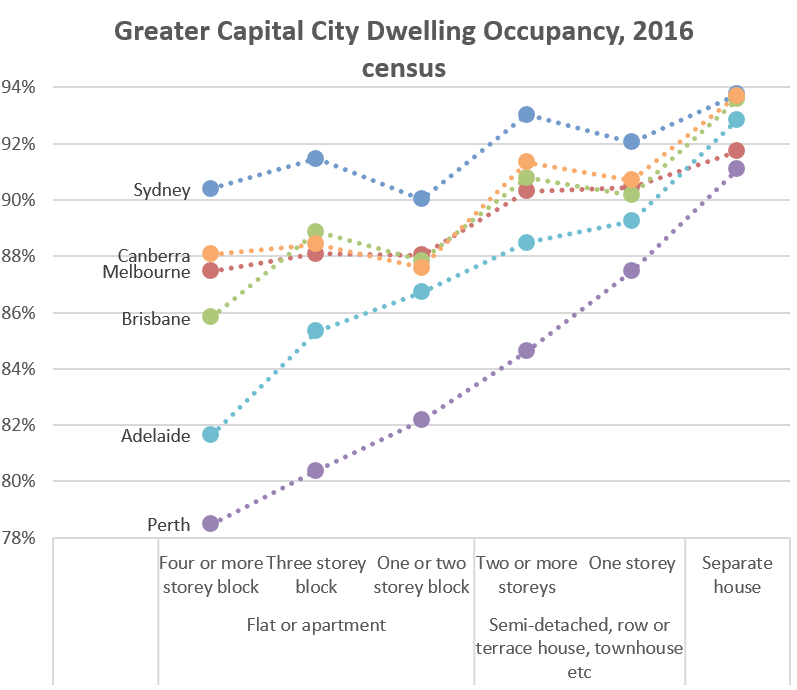 How does dwelling occupancy in capital cities compare to the rest of the country? 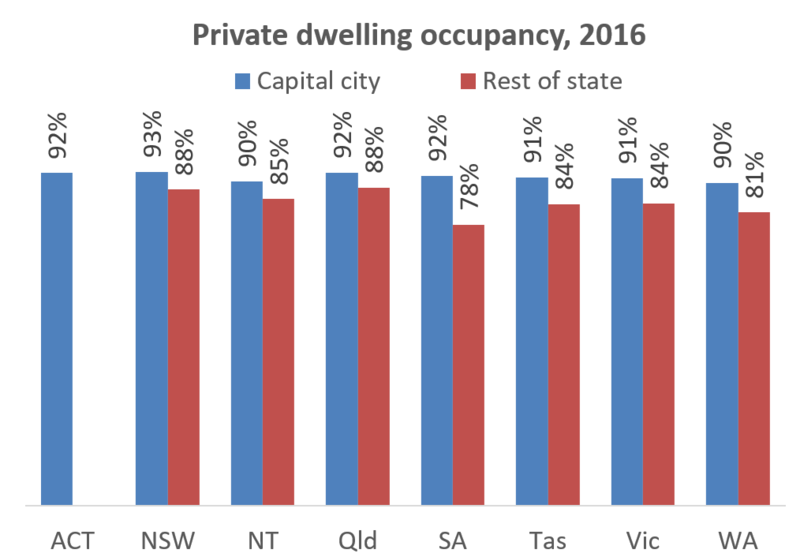 Private dwelling occupancy is significantly lower outside the capital city areas. While the capital city areas contain 63% of all private dwellings, they only contain 51% of unoccupied private dwellings. How does dwelling occupancy vary by dwelling type? In many cities there is a strong correlation between housing type and occupancy, with separate houses having the highest occupancy rates, and multi-storey flats/apartments having the lowest. 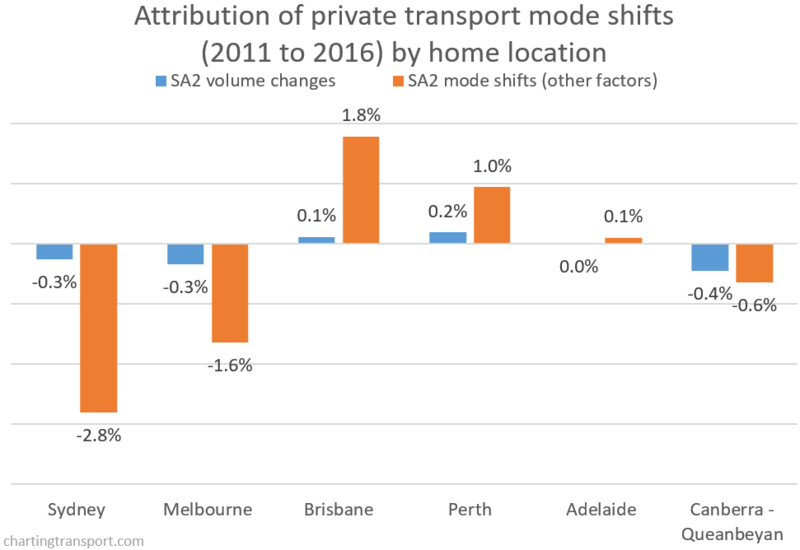 The pattern is strongest in Perth – perhaps reflecting reduced demand for apartment living following the end of the mining boom(?). 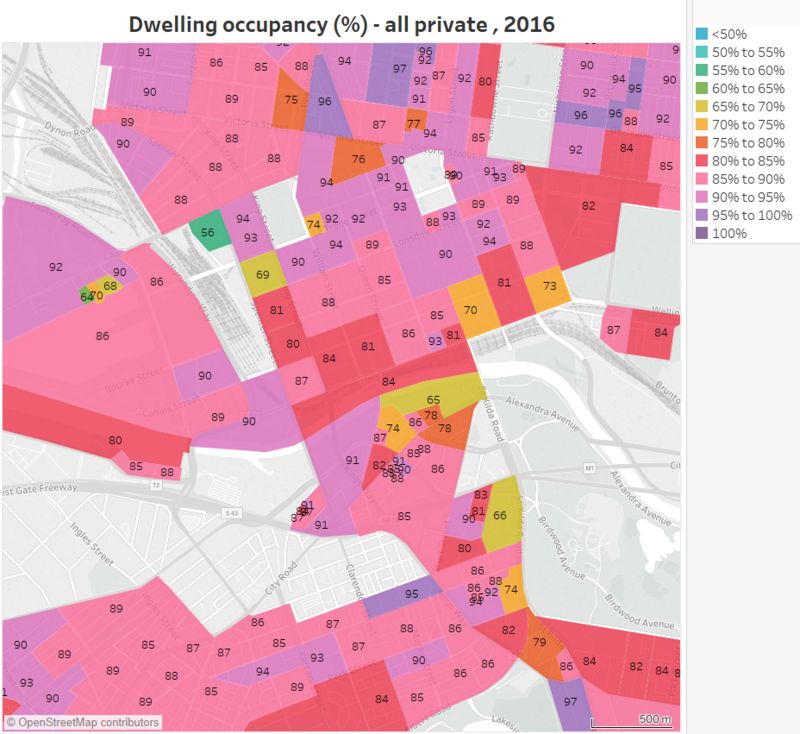 The data suggests higher density apartments are more likely to not be occupied on census night, but it doesn’t tell us why. Of course different dwelling types have different spatial distributions, so is it the dwelling type that drives the occupancy rates? I’ll come back to that shortly. Where are the unoccupied dwellings? (I’ve not shaded SA2s with less than 1 unoccupied dwelling per hectare. You can look at other cities in Tableau by zooming out and then in on another city). You can see a fairly significant increase in the number of unoccupied dwellings in the inner and middle suburbs (at least at densities above 1 per hectare). 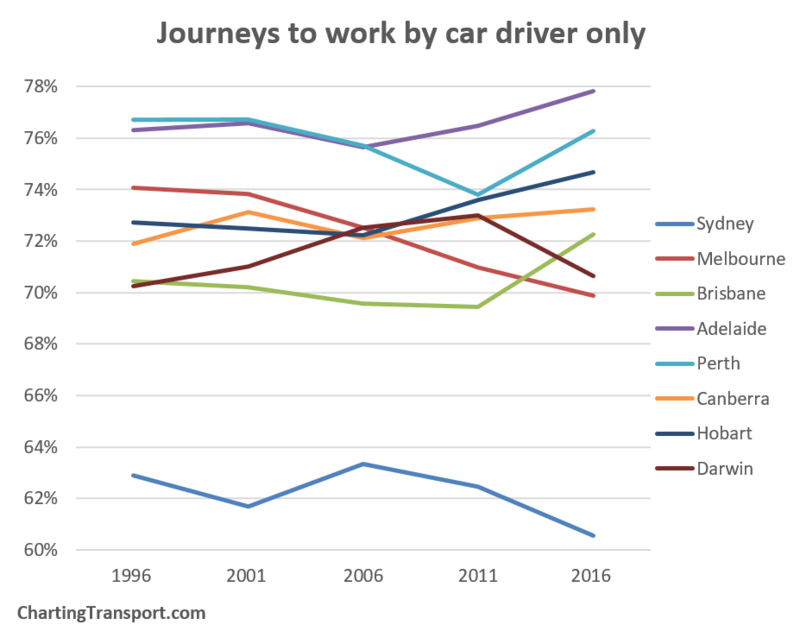 From a transport perspective – this isn’t great. 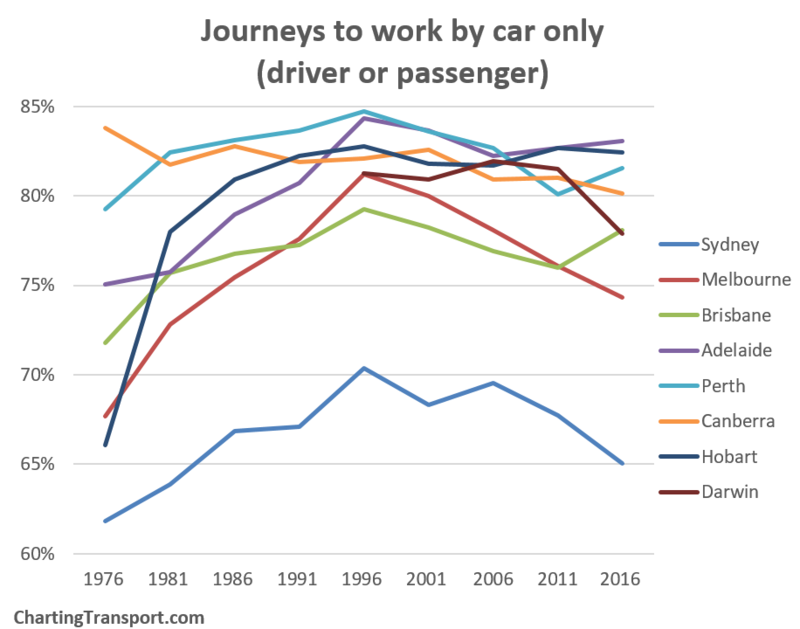 If people lived in those dwellings rather than dwellings on the fringe of Melbourne, the transport task would be easier as there would be many more people living closer to jobs and other destinations with non-car modes being more competitive. Given you would expect a small percentage of dwellings to be unoccupied for good reasons (eg resident temporarily absent, or property on the market), it makes sense that the density of unoccupied dwellings has gone up with total dwelling density. But a decrease in the dwelling occupancy rate requires the number of unoccupied dwellings to be growing at a faster rate than the total number of dwellings. We already know that is happening at the city level through declining occupancy rates, so how does that look inside cities? 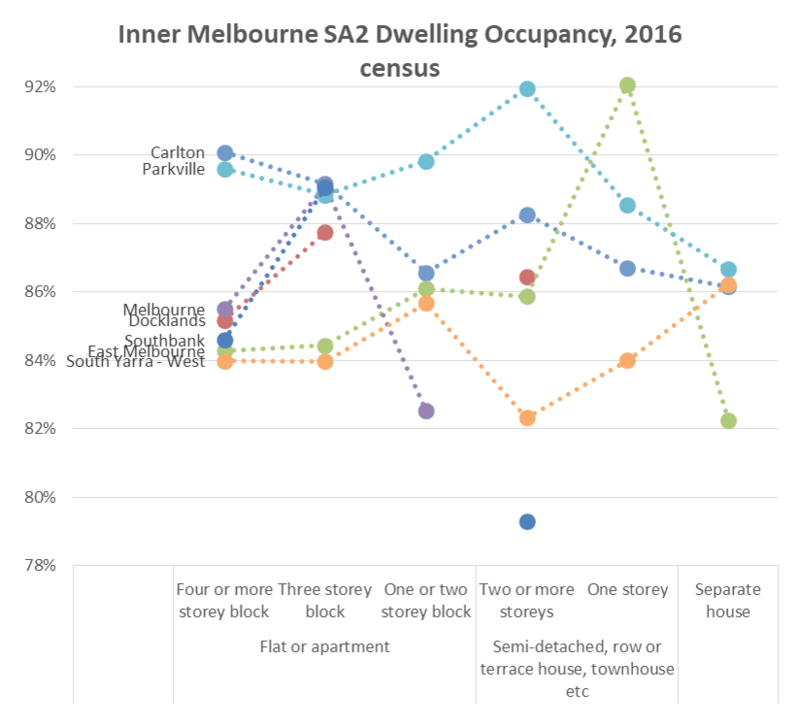 How does dwelling occupancy vary across Melbourne? 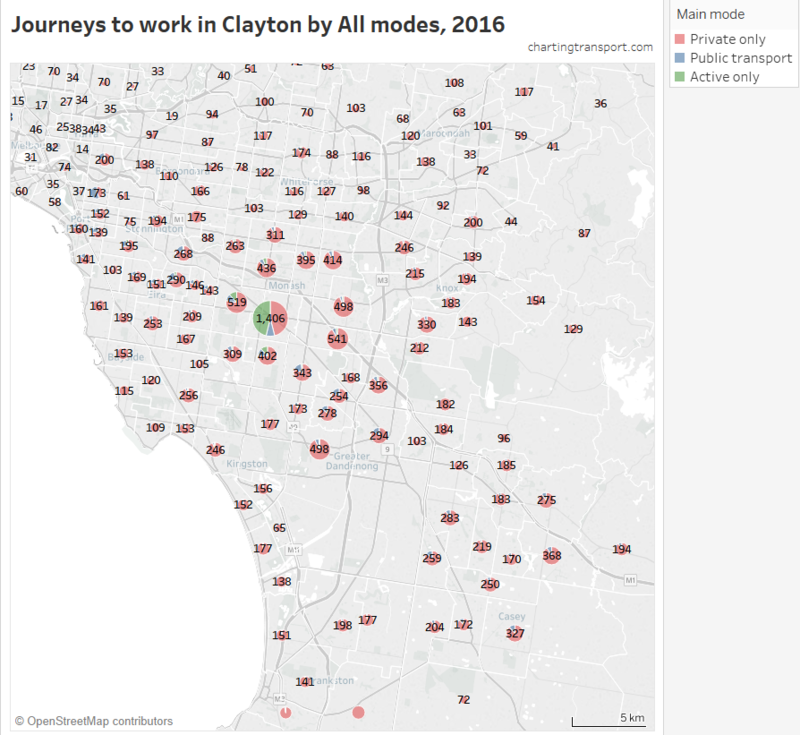 You can see very clearly that occupancy is lowest on Mornington Peninsula beaches to the south – which almost certainly reflects empty holiday homes on census night (a Tuesday night in winter). 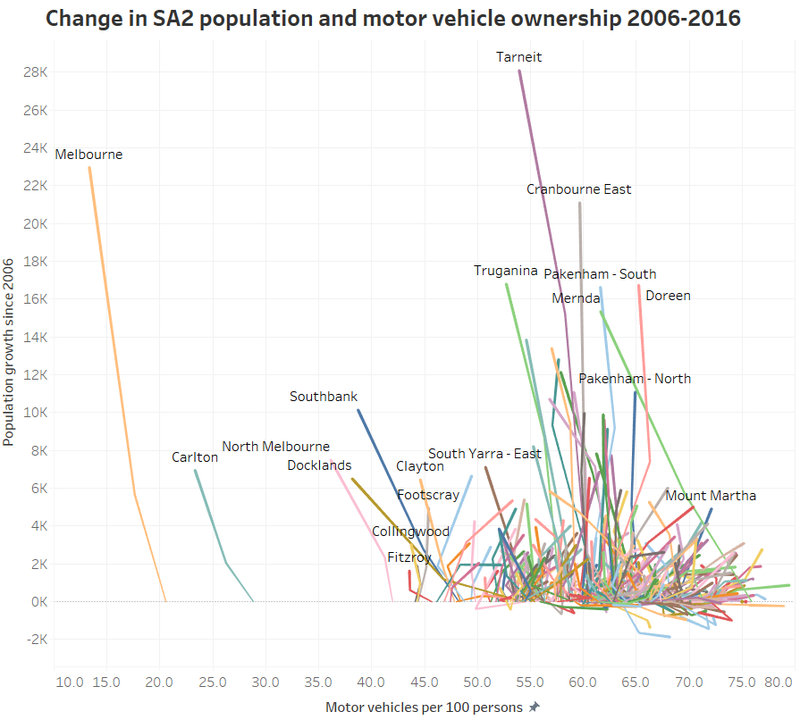 The previous Melbourne map at CD/SA1 level is very detailed and so it’s not easy to see the overall trends. 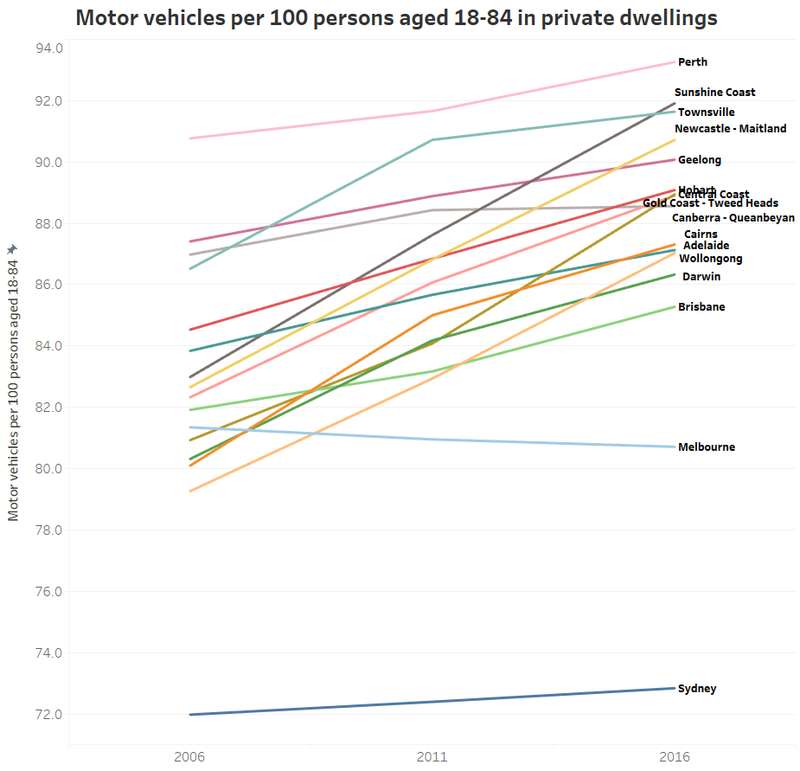 Also, apart from the Mornington Peninsula, occupancy rates are almost all above 80%. 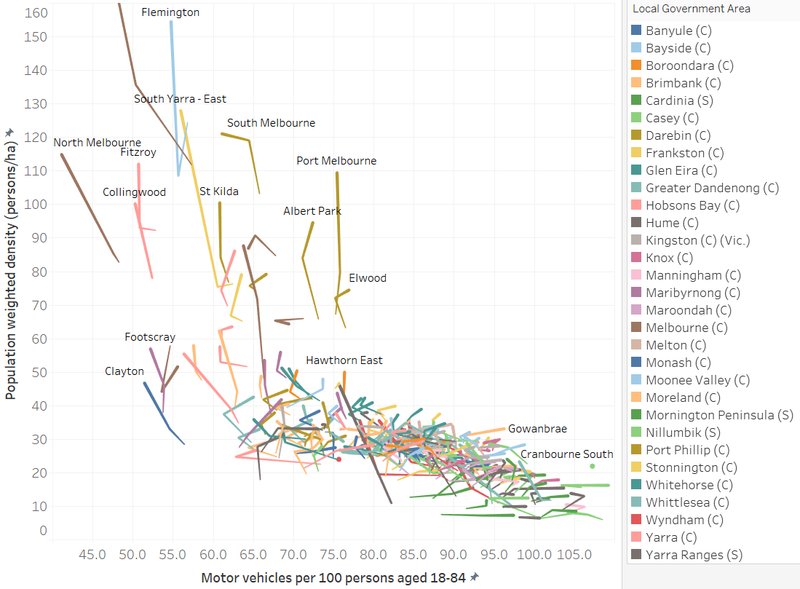 The highest dwelling occupancy is generally on the fringe of Melbourne. Apart from holiday home areas, the lowest occupancy in 2016 was concentrated in wealthier inner suburbs, including Toorak at 83% and South Yarra west at 84%. 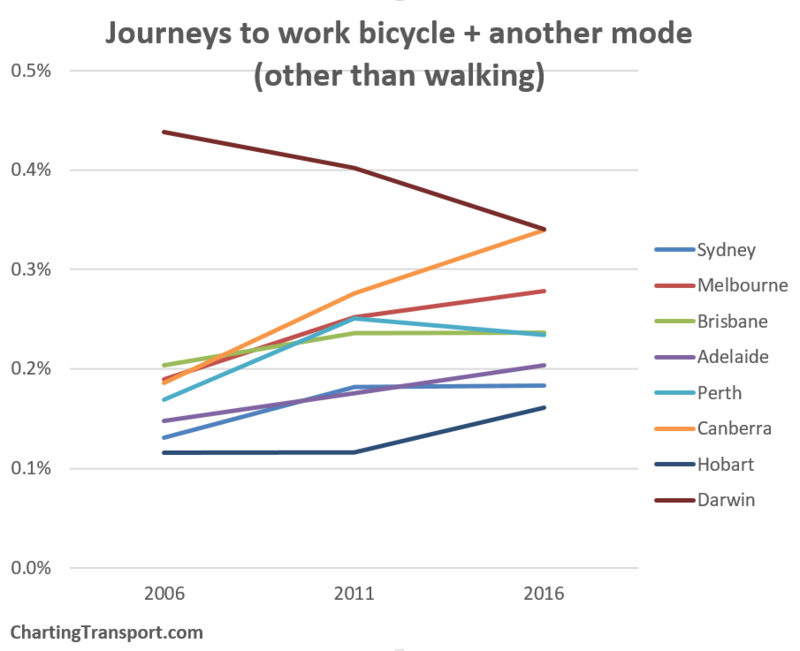 This was closely followed by the CBD, Docklands, East Melbourne, Southbank, and Albert Park between 84% and 86%. These areas have all had declining occupancy since 2011. 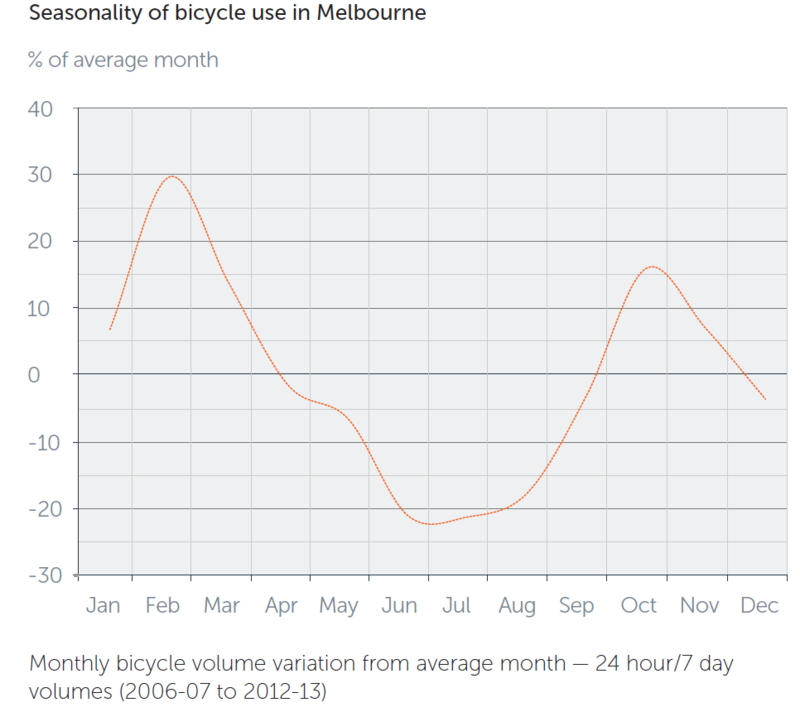 There are at least small declines in most parts of Melbourne. The biggest decline was 7% in Bundoora North (with lowest 2016 occupancy of 79% in these new units in University Hill ), followed by 5% in Doncaster (lowest around Doncaster Hill where there are new apartments, perhaps too new to be occupied on census night? 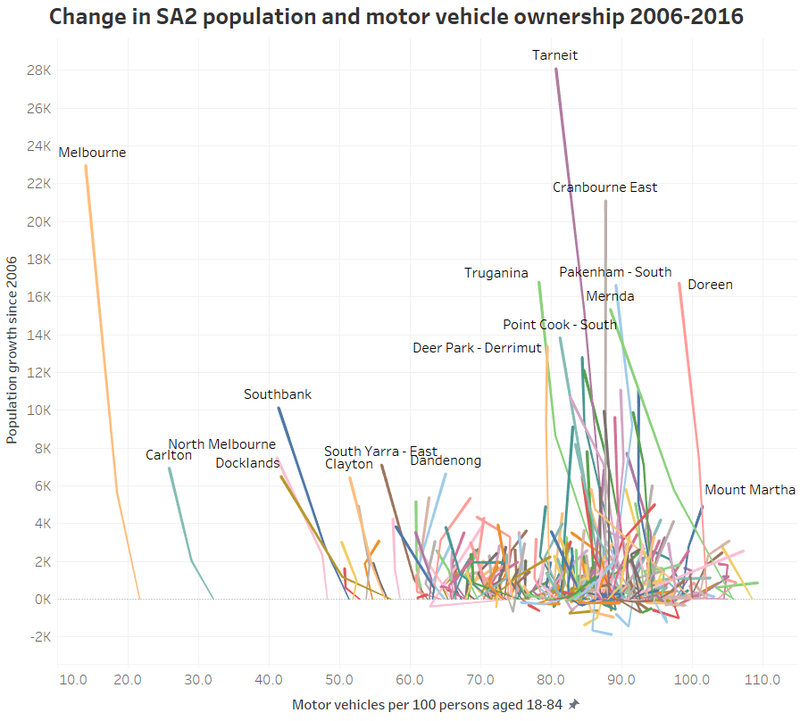 ), 4% in South Yarra East (lowest in the new apartments around South Yarra Station, again possibly because some are very new) and Prahran – Windsor. Curiously, Docklands dwelling occupancy increased by 9% from 75% to 85% (rounding means that those numbers don’t perfectly add). Perhaps there were many new yet-to-be-occupied dwellings in 2006? For reference, Dockland’s 2011 occupancy was 84%, only slightly below the 2016 level. The outer growth areas are a mixed bag of increases and decreases. This possibly depends again on how many brand new but not yet occupied dwellings there were in 2006 and 2016. What are the dwelling occupancy patterns in other cities? 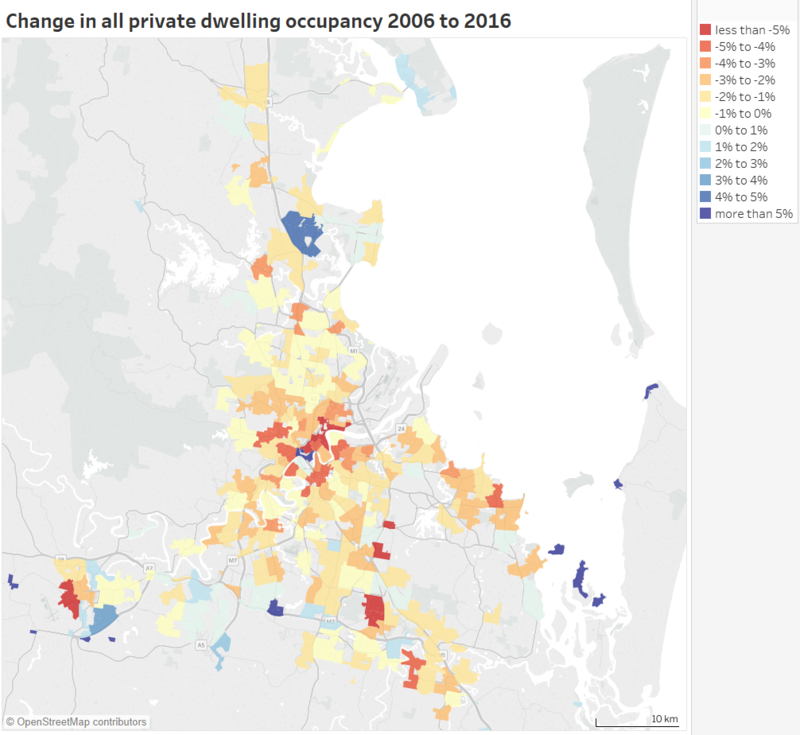 You can see lower occupancy around the CBD, North Sydney, Manly, and the northern beaches, and higher occupancy in the western suburbs. 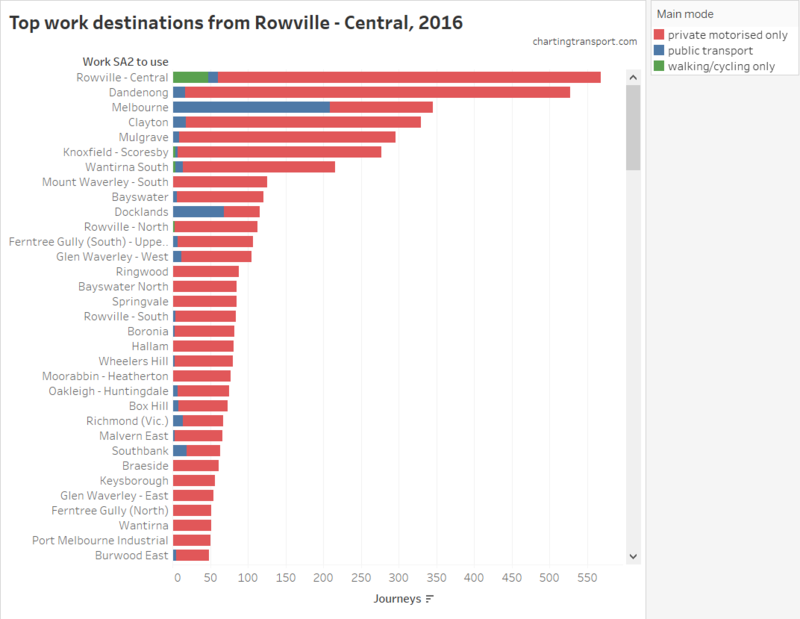 Brisbane has some big declines to the north-east of the city centre, Rochedale – Burbank, Woodridge, Logan, and Leichhardt – One Mile. The Redland Islands in the east are presumably a popular place for holiday homes. Low occupancy is evident around Mandurah in the south (a popular holiday home area). 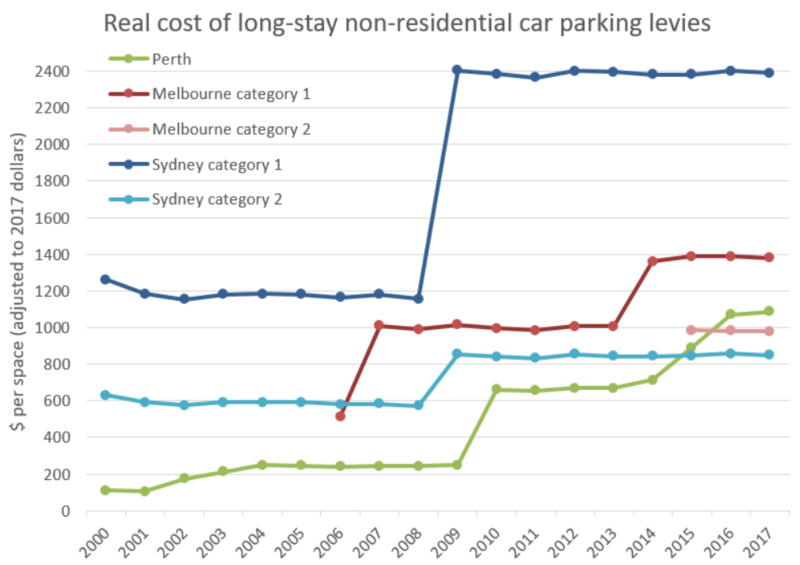 Lower occupancy has spread around the inner city, and beach-side suburbs of Scarborough, Cottesloe, Fremantle, and Rockingham (many of which are areas with higher concentrations of Airbnb properties). 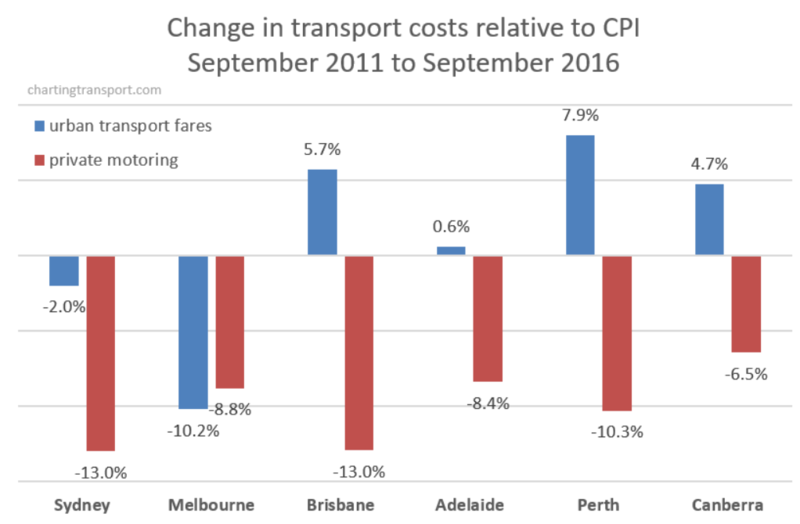 The biggest declines were in Maylands, Victoria Park – Lathlain – Burswood, and South Lake – Cockburn Central. For the first two of these areas the decline was mostly in flats/units/apartments. 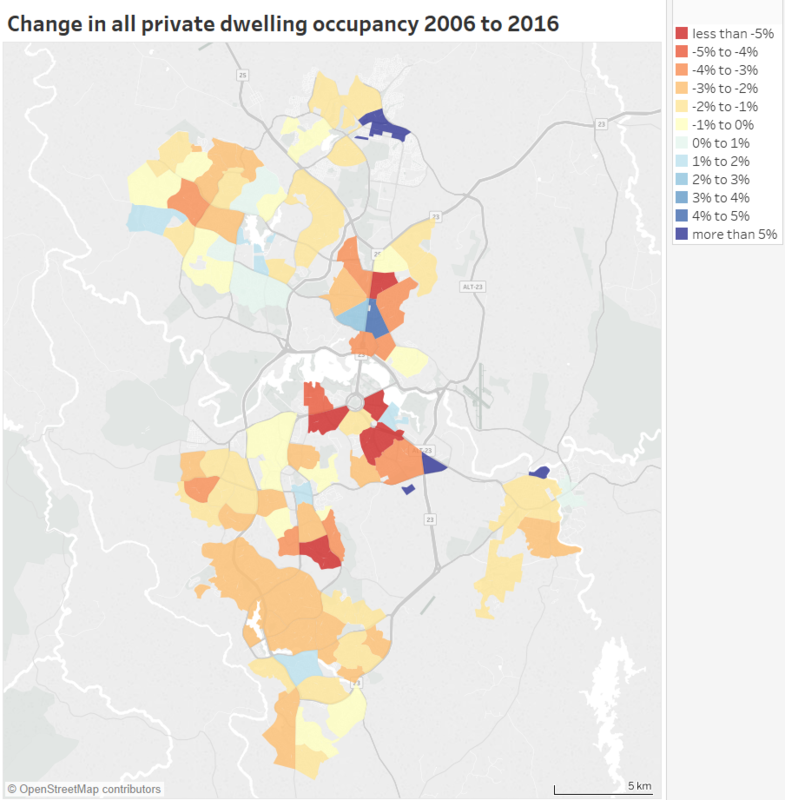 Dwelling occupancy was lowest around Parliament House (the census was not during a sitting week in 2016), and highest in the outer northern and southern suburbs. The 2006 census was during a sitting week, so it’s little surprise that big dwelling occupancy reductions were seen around Capital Hill between 2006 and 2016. 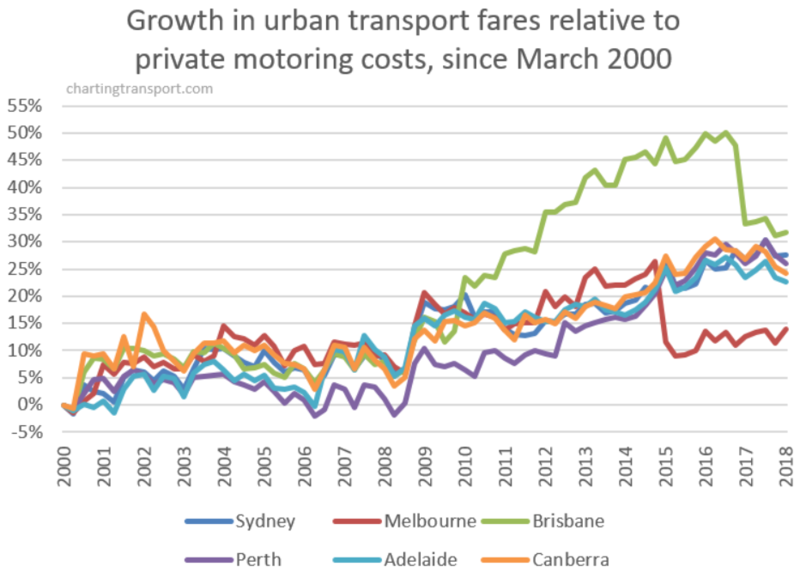 There was also a 5% decline in Farrer and a 6% growth in Gungahlin between 2006 and 2016 (Gungahlin’s dwellings almost doubled between 2006 and 2011, so the 2006 result might reflect brand new dwellings awaiting occupants). 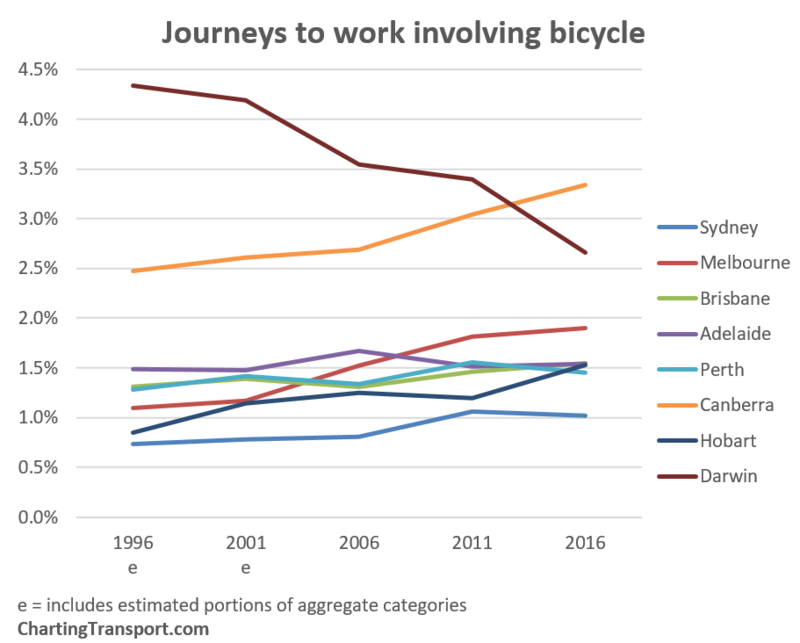 Dwelling occupancy was lowest in central Hobart, with the biggest decline of 4% in Old Beach – Otago, but overall there was little change between 2006 and 2016 (average occupancy did drop slightly in 2011 though). Darwin dwelling occupancy was lowest in the city centre at 82% in 2016, while Howard Springs had 100% occupancy (in 2016). Declines are evident between 2006 and 2016 across most parts of Darwin. You can see quite clearly that the beach-side areas have low occupancy, while the inland areas have much higher occupancy (some at 100%). Presumably many permanent residents cannot or choose not to compete with tourism for beach-side living. 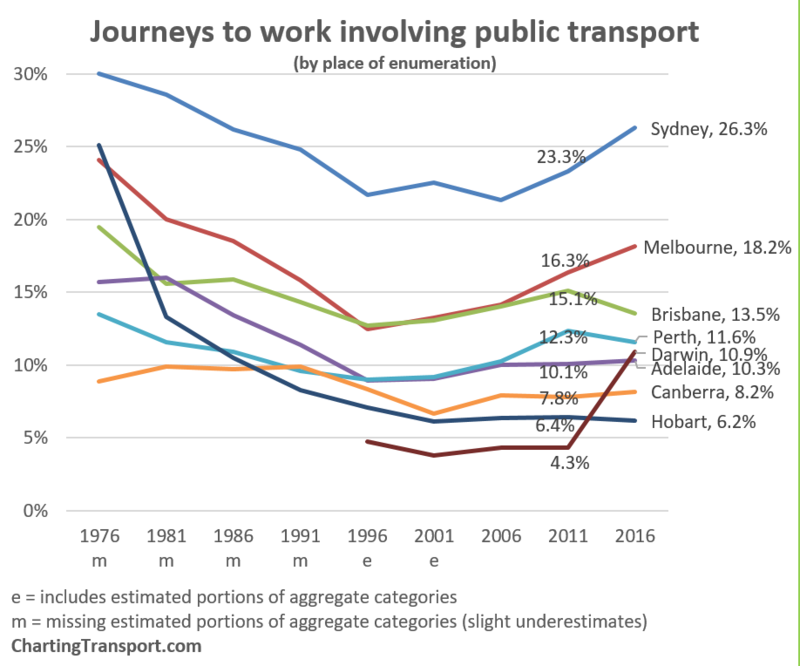 If you want to see other cities, move around Australia in Tableau for occupancy maps at CD/SA1 and SA2 geography (choose you year of interest), and occupancy change maps (at SA2 geography). So are there lots of unoccupied inner city apartments in Melbourne? Some commentators have spoken about many inner city apartments being unoccupied – perhaps through a glut or investors chasing capital gains and not interested rental incomes. 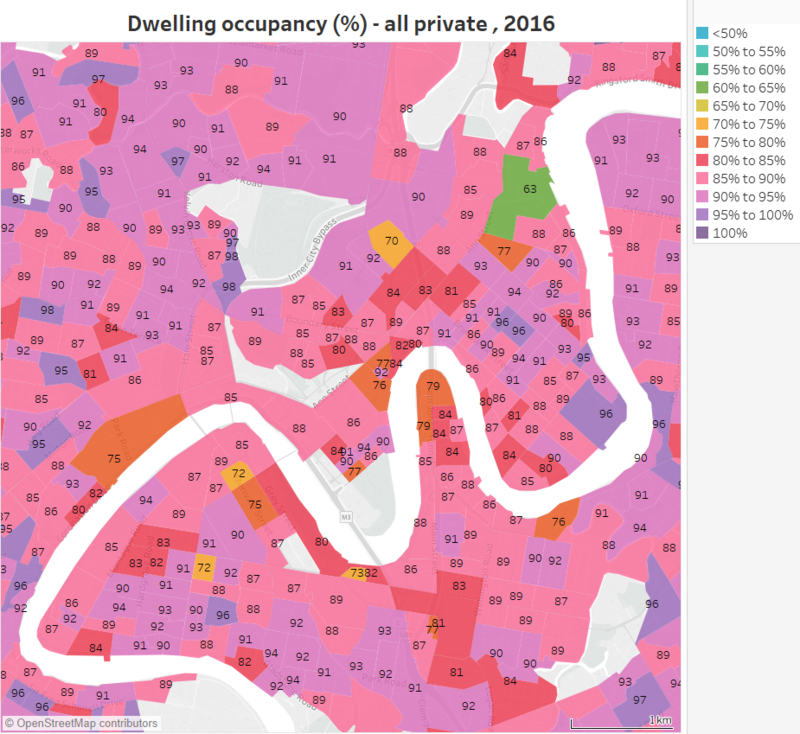 There are quite a few pockets of very low occupancy, particularly areas shaded in yellows and greens. The average private dwelling occupancy for the City of Melbourne local government area was 87%, lower than the Greater Melbourne average of 91%. The lowest occupancy is a block between Adderley, Spencer and Dudley Street in North Melbourne at 56%, which is probably related to the recent completion of an apartment tower not long before the census (from Google Street view we know it was under construction in April 2015 and completed by October 2016). 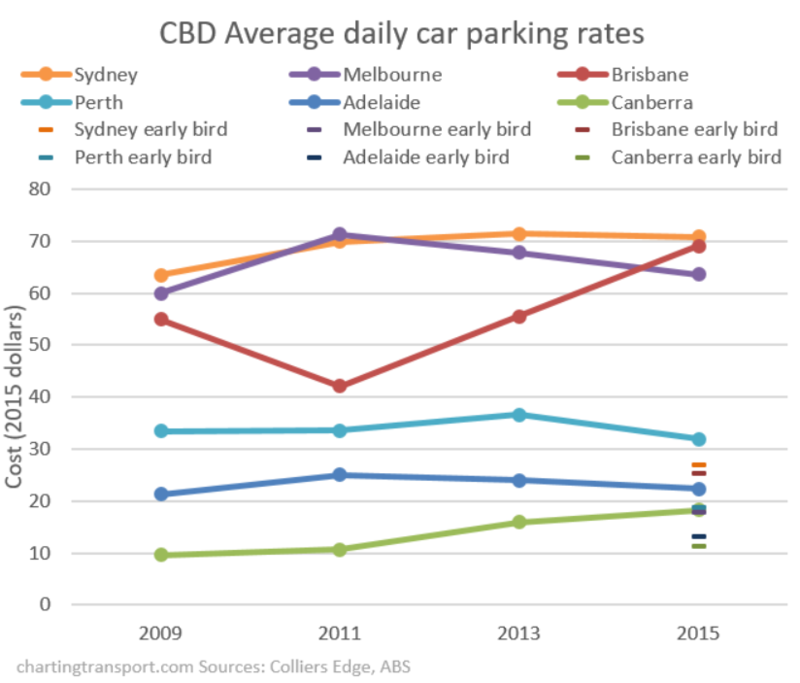 There are several patches of yellow (65-70% occupancy) in the CBD, Docklands and Southbank. But what about apartment towers? For that we need to drill down to mesh blocks – and thankfully 2016 census data is actually provided at this level. 48% for an apartment tower at 555 Flinders Street (Northbank Place Central Tower) between Spencer and King Street and the railway viaduct. It wasn’t brand new in 2016. 66% for a tower at 28 Southgate Ave (corner City Road), and 67% for the Quay West tower next door (almost certainly popular places for Airbnb / serviced apartments). Several of these towers include advertised serviced apartments, and I expect the towers would contain a mix of serviced apartments, owner-occupied apartments and rentals (regular and Airbnb). However ABS advises me that field officers do speak to building managers, and are therefore likely to not code serviced apartments as private dwellings. 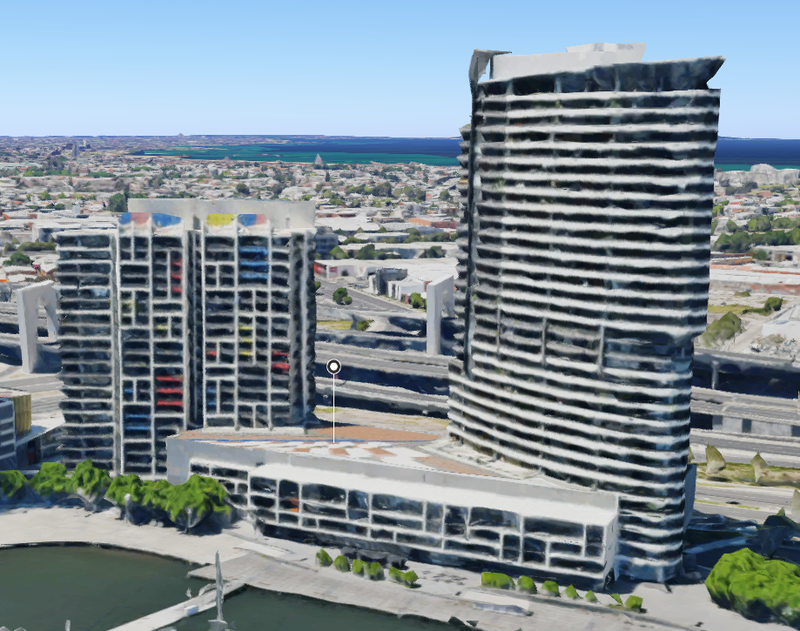 That said, according to the 2016 census data there were only 11 non-private dwellings in Docklands that were classified as “Hotel, motel, bed and breakfast”, and zero non-private dwellings in the New Quay apartment towers. Of course you wouldn’t expect lights to be on in all rooms in all occupied dwellings at 9pm on a particular Sunday, but I dare say it’s probably a time when fewer people would be out. It looks like a lot less than a quarter of rooms are lit. I know very few of these are on Airbnb (more on that in a future post! ), but I don’t know how many are actually serviced apartments. There’s not a strong relationship between density and occupancy. The variation in dwelling occupancy between mesh blocks will probably depend on a lot of local factors. What about occupancy by dwelling type for the inner city? 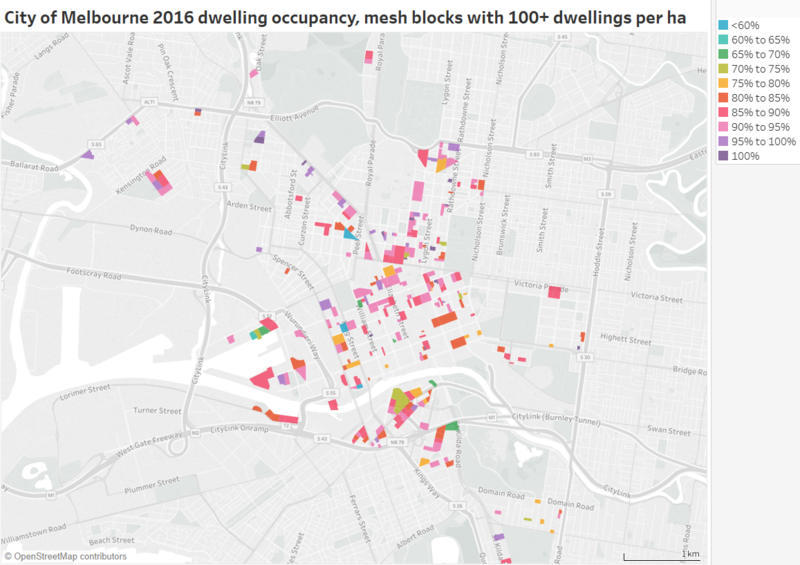 (data points removed where dwelling counts were small, the isolated blue dot at the bottom is for Southbank). There’s no evidence that flats / apartments have lower occupancy than other housing types in the central city. However there is evidence that inner city areas have relatively lower occupancy. So how does the occupancy of apartment blocks of 4+ storeys vary across Melbourne? Box Hill had the lowest apartment occupancy of 50% (perhaps some were brand new? 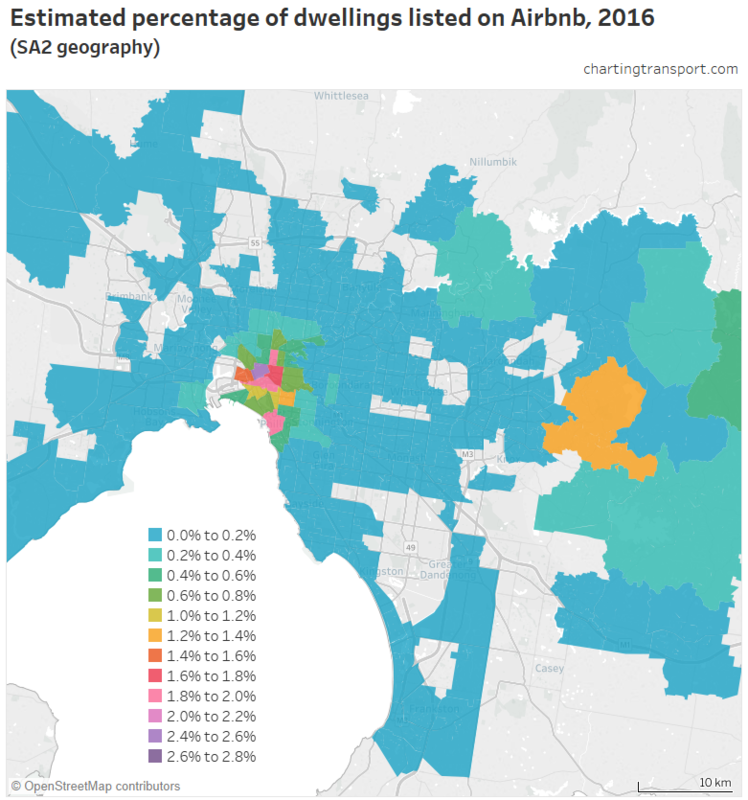 ), followed by Ringwood, Glen Waverley, and Brighton in the 70-75% range. Croydon East, Templestowe , Seddon – Kingsville, Clayton, Carnegie, West Footscray, Braybrook and Frankston reported occupancy above 95%. 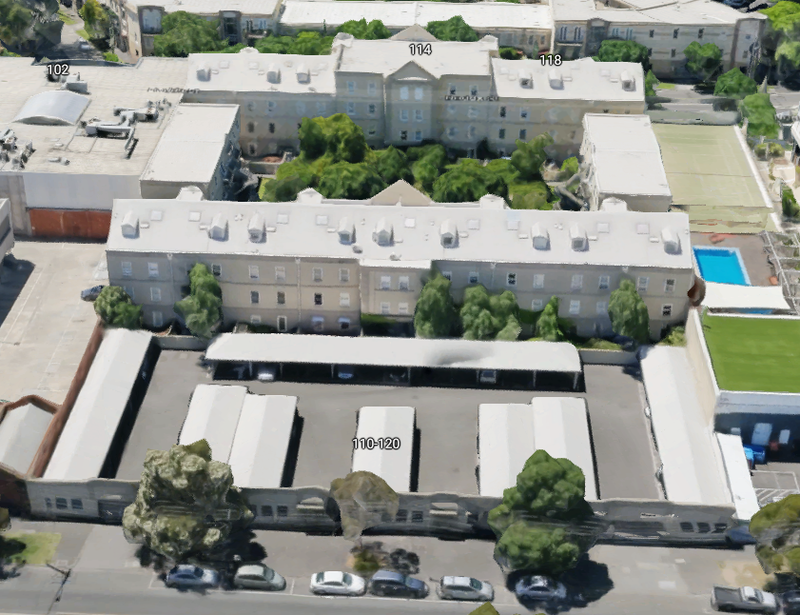 The inner city areas were around 84-85% occupied, and these would make up the majority of such dwellings in Melbourne. Apartments in blocks of 4+ storeys seem to have lower occupancy on average because most of them are located in the central city, which generally has lower dwelling occupancy. 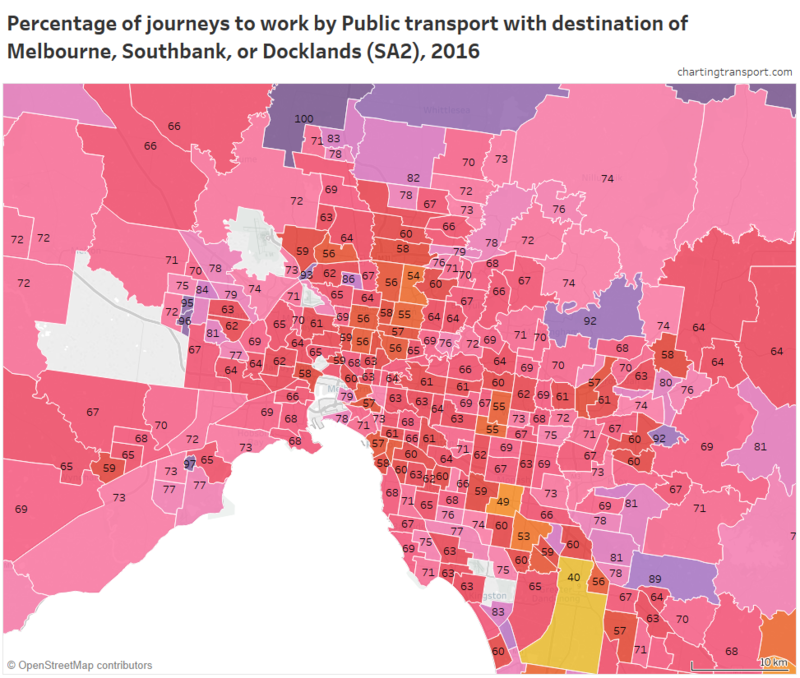 The lowest rates in metropolitan Melbourne are 82-83% in some inner city areas, while the urban growth shows up in pink and purple, mostly 94-96%. 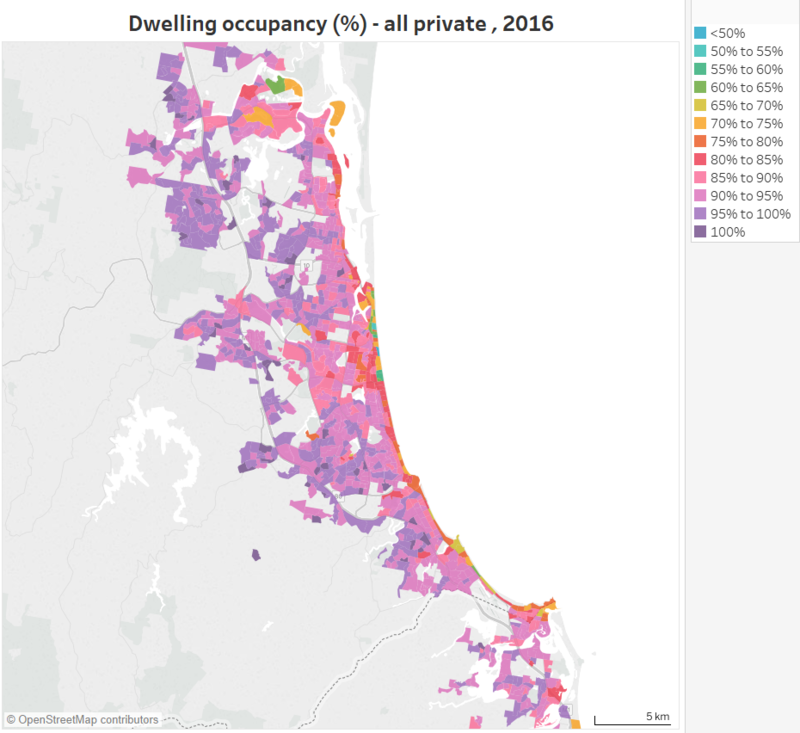 Explore the 2016 occupancy rates at SA2 geography for different dwelling types for any part of Australia in Tableau. You can also view changes in occupancy rates since 2006 for separate houses, flats/units/apartments, and semi-detached/townhouses. Why are there lower dwelling occupancy rates in the central city? Many dwellings are rented out on Airbnb (and/or other platforms) – but are not in high demand on a weeknight in mid-winter (more on that in this post). Many dwellings are serviced apartments that are indistinguishable from regular private dwellings (in buildings with a mixture of dwelling use). ABS say they don’t count these as private dwellings, however they are not showing up as non-private dwellings. Dwellings are more likely to occupied by executives who travel more frequently. Dwellings might be second homes for people living outside the city. 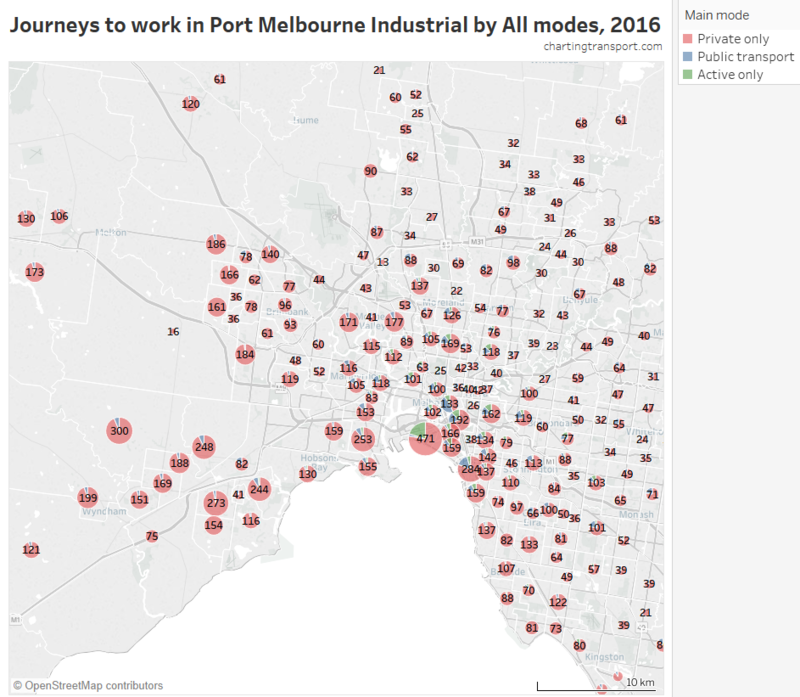 Dwellings might be owned by employers for interstate staff visiting Melbourne. Dwellings might be poorly constructed and uninhabitable (eg mould issues). Investors who are not interested in rental income might deliberately leave properties vacant (something that is disputed). What about dwelling occupancy in the centre of other cities? 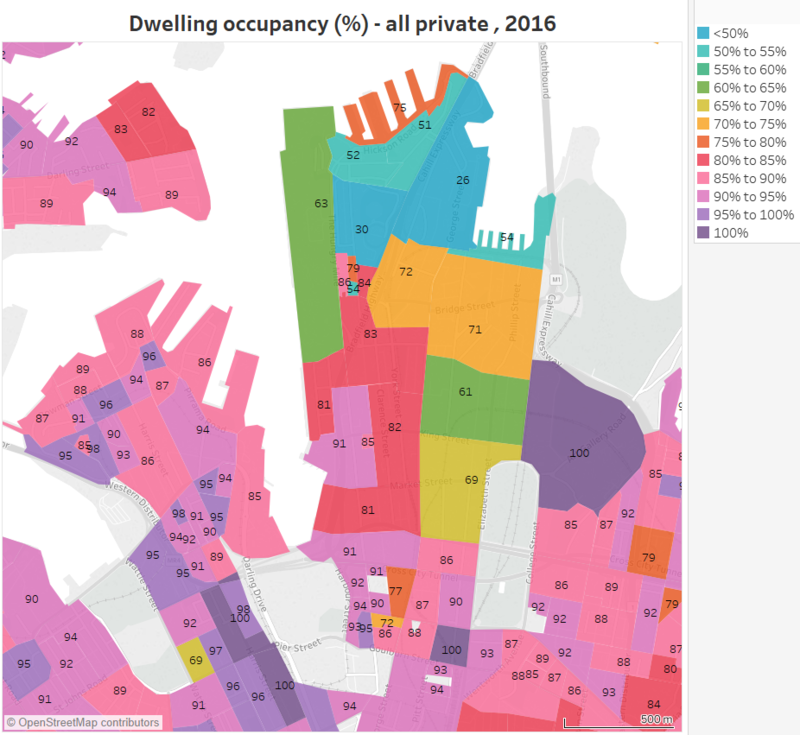 There are some very low occupancy rates in the north end of the CBD, but very high occupancy rates around Darling Harbour and Pyrmont. 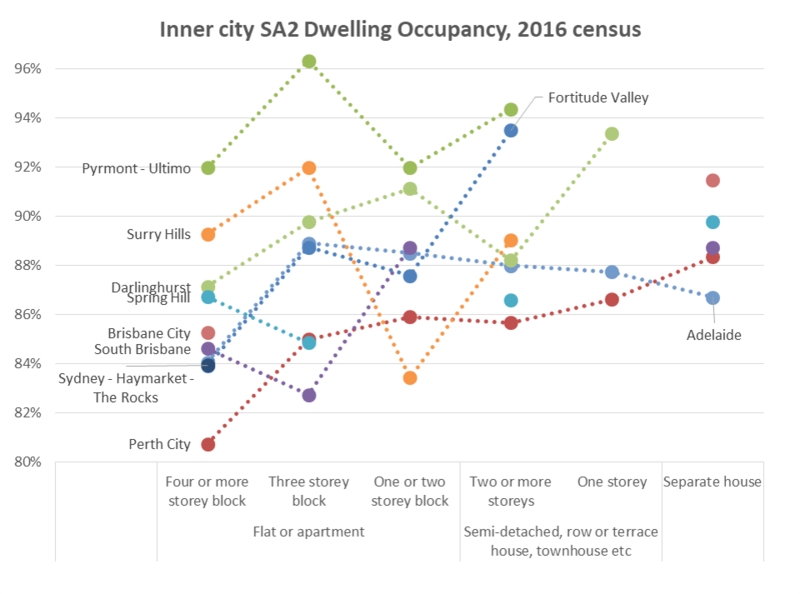 In all SA2s except Surrey Hills (Sydney) and South Brisbane, flats or apartments in 4+ storey blocks had the lowest dwelling occupancy in 2016. 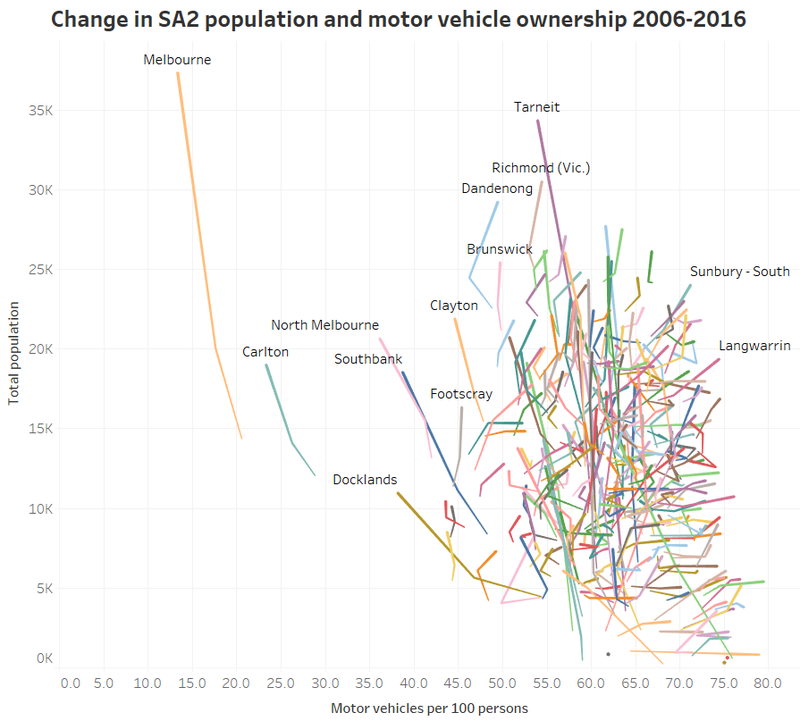 Only in Perth City SA2 (which is quite a bit larger than the CBD) is there a reasonably clear relationship between housing type and occupancy. 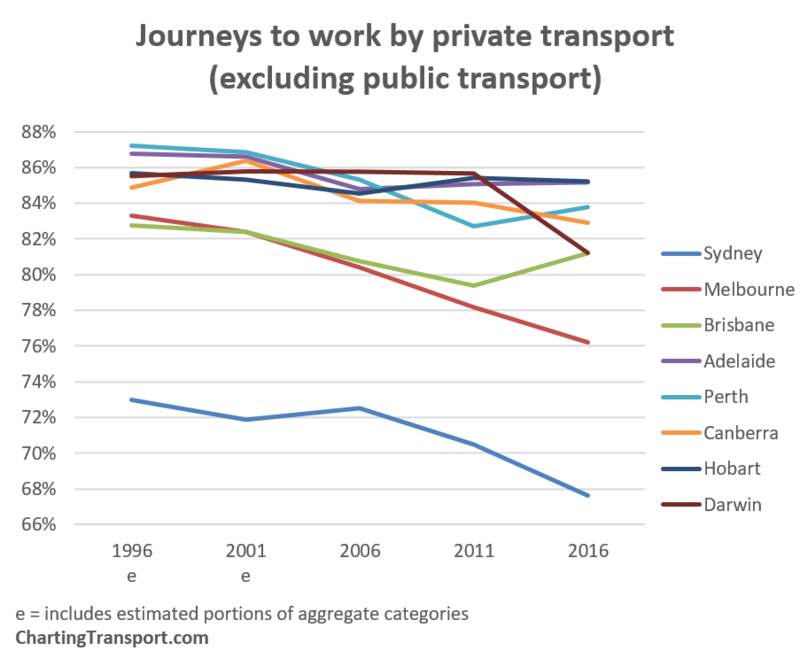 Dwelling occupancy, as measured by the census, has declined in most Australian cities between 2006 and 2016 (particularly larger cities). Dwelling occupancy is generally very low in popular holiday home areas, but also relatively low in central city locations. Dwelling occupancy is generally highest in outer suburban areas. Higher density housing types generally have lower occupancy, but that is probably because they are more often found in inner city areas. 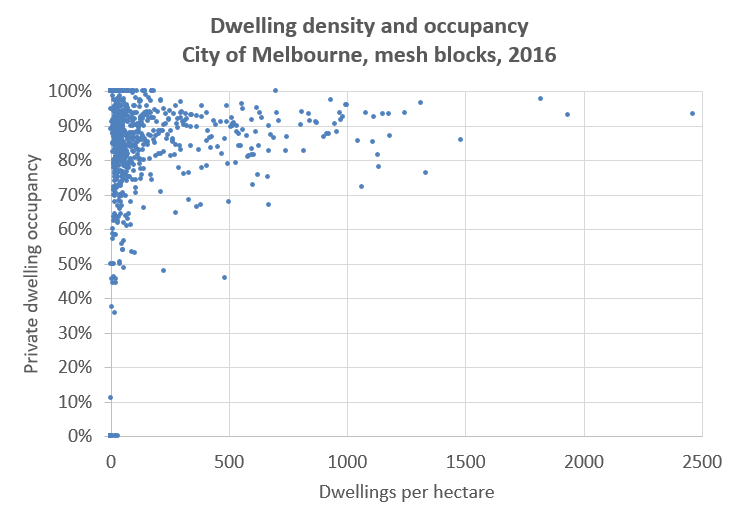 There are examples of low occupancy apartment towers in Melbourne, but there’s not a clear relationship between dwelling density and dwelling occupancy in central Melbourne. In a future post I plan to look more at why properties might be unoccupied, and for how long they are unoccupied, drawing on Airbnb and water usage datasets. I might also look at bedrooms and bedroom occupancy which is a whole other topic. 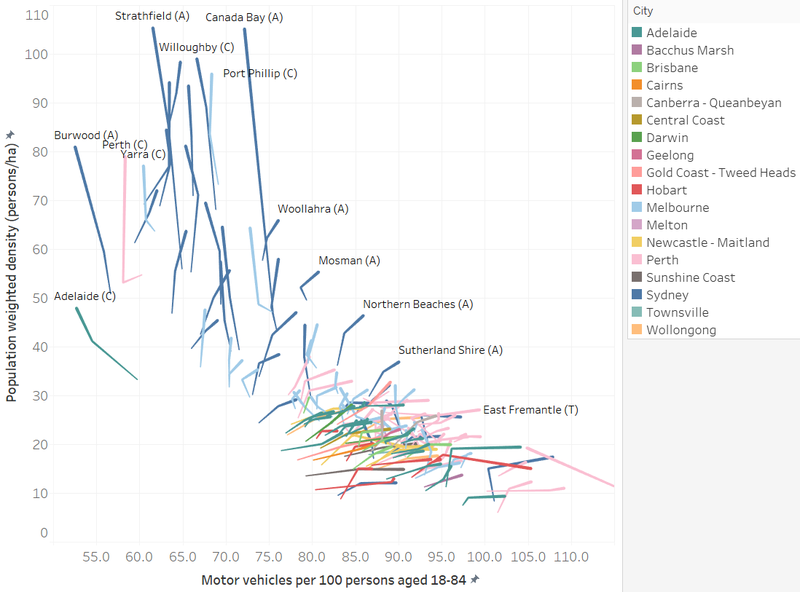 I’ve loaded census data about occupied and unoccupied private dwellings data into Tableau for 2006, 2011, and 2016 censuses for sixteen Australian cities at the CD (2006) / SA1 (2011,2016) level, which the smallest geography available for all censuses. I’ve mapped all these CDs and SA1s to boundaries of 2016 SA2s and 2011 Significant Urban Areas (as per my last post). Those mappings are unfortunately not perfect, particularly for 2006 CDs. The ABS determine a private dwelling to be occupied if they have information to suggest someone was living in that dwelling on census night (eg a form was returned, or there was some evidence of occupation). Under this definition, unoccupied dwellings include those with usual residents temporarily absent, and those with no usual residents (vacant). For my detailed maps I’ve only included CDs / SA1s with a density of 2 dwellings per hectare or more. Just how much denser are European cities compared to Australian cities? What about Canadian and New Zealand cities? And does Australian style suburbia exist in European cities? This post calculates the population-weighted density of 53 Australian, European, and Canadian cities with a population over 1 million, plus the three largest New Zealand cities (only Auckland is over 1 million population). It also shows a breakdown of the densities at which these cities’ residents live, and includes a set of density maps with identical scale and density shading. As discussed in previous posts, population-weighted density attempts to measure the density at which the average city resident lives. Rather than divide the total population of a city by the entire city area (which usually includes large amounts of sparsely populated land), population weighted density is a weighted average of population density of all the parcels that make up the city. As I’ve shown previously, the size of the parcels used makes a big difference in the calculation of population-weighted density, which makes comparing cities difficult internationally. To overcome the issue of different parcel sizes, I’ve used kilometre grid population data that is now available for both Europe and Australia. I’ve also generated my own kilometre population grids for Canadian and New Zealand cities by proportionally summing populations of the smallest census parcels available. You can see that many of the grid cells that include significant amounts of water show a lower density, when it fact the population of those cells are contained within the non-water parts of the grid cell. The more watery cells, the lower the calculated density. This is could count against a city like Sydney with a large harbour. The second challenge with these calculations is a definition of the city limits. For Australia I’ve used Urban Centre boundaries, which attempt to include contiguous urbanised areas (read the full definition). For Europe I’ve used 2011 Morphological Urban Areas, which have fairly similar rules for boundaries. For Canada I’ve used Population Centre, and for New Zealand I’ve used Urban Areas. These methodologies tend to exclude satellite towns of cities (less so in New Zealand and Canada). While these boundaries are not determined in the exactly the same way, one good thing about population-weighted density is that parcels of land that have very little population don’t have much impact on the overall result (because their low population has little weighting). For each city, I’ve included every grid cell where the centroid of that cell is within the defined boundaries of the city. Yes that’s slightly arbitrary and not ideal for cities with dense cores on coastlines, but at least I’ve been consistent. It also means some of the cells around the boundary are excluded from the calculation, which to some extent offsets the coastline issues. 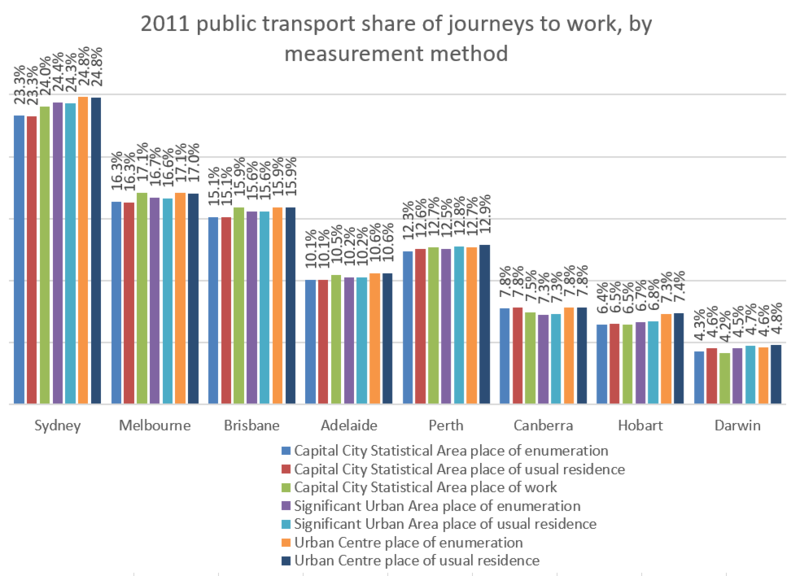 It also means the values for Australian cities are slightly different to a previous post. All source data is dated 2011, except for France which is 2010, and New Zealand which is 2013. 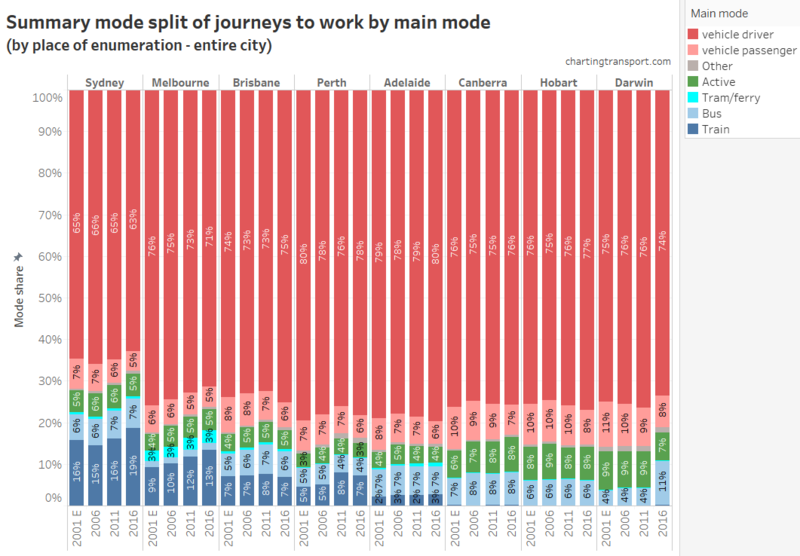 You can see the five Australian cities are all at the bottom, most UK cities are in the bottom third, and the four large Spanish cities are within the top seven. Sydney is not far below Glasgow and Helsinki. 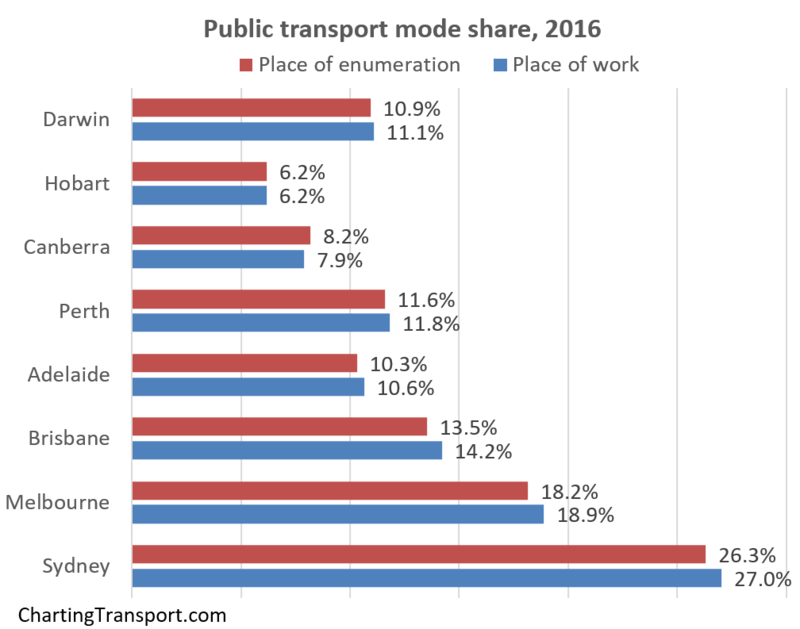 Adelaide, Perth and Brisbane are nothing like the European cities when it comes to (average) population-weighted density. Three Canadian cities (Vancouver, Toronto and Montreal) are mid-range, while the other three are more comparable with Australia. Of the New Zealand cities, Auckland is surprisingly more dense than Melbourne. Wellington is more dense that Vancouver (both topographically constrained cities). How much diversity is there in urban density? 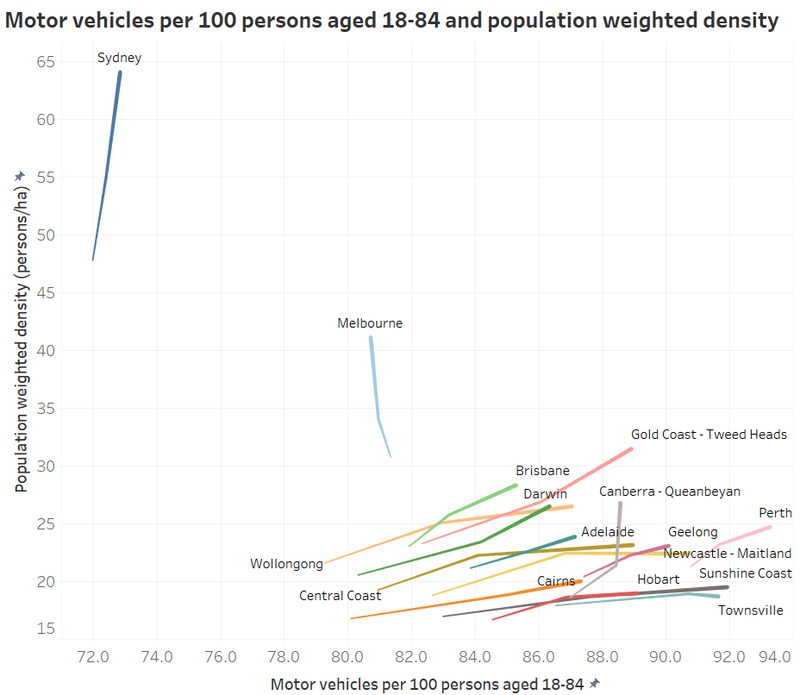 Because of the massive variations in density, I had to break the scale interval sizes at 100 persons per hectare, and even then, the low density Australian cities are almost entirely composed of the bottom two intervals. You can see a lot of density diversity across European cities, and very little in Australian cities, except perhaps for Sydney. 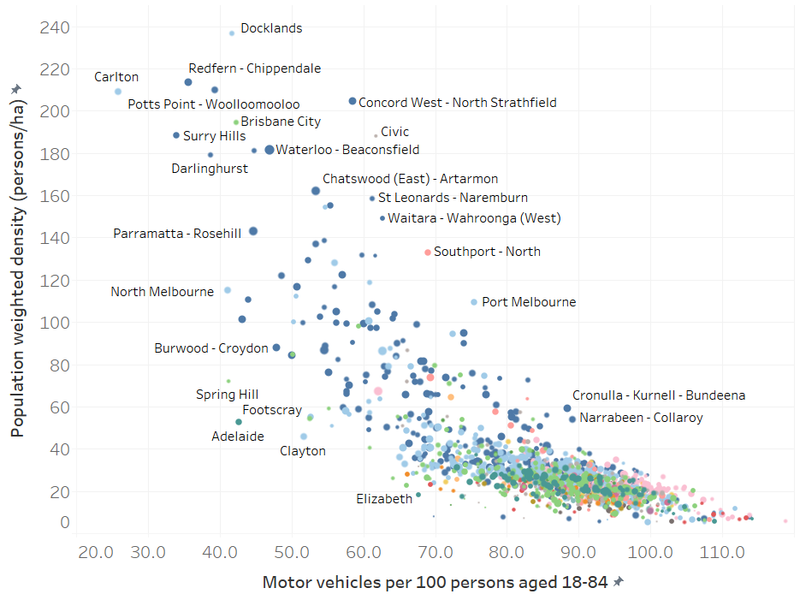 Do many people in European cities live at typical Australian suburban densities? Do many Europeans living in cities live in detached dwellings with backyards, as is so common in Australian cities? To try to answer this question, I’ve calculated the percentage of the population of each city that lives at between 10 and 30 people per hectare, which is a generous interpretation of typical Australian “suburbia”. How different is population-weighted density from regular density? The correlation is relatively high, but there are plenty of outliers, and rankings are very different. Rome has a regular density of 18, but a PWD of 89, while London has a regular density of 41 and PWD of 80. Dublin’s regular density of 31 is relatively close to its PWD of 47. Wellington’s regular density is 17, but its PWD is 49 (though the New Zealand cities regular density values are impacted by larger inclusions of non-urbanised land within definitions of Urban Areas). So what does the density of these cities look like on a map? The following maps are all at the same scale both geographically and for density shading. The blue outlines are urban area boundaries, and the black lines represent rail lines (passenger or otherwise, and including some tramways). The density values are in persons per square kilometre (1000 persons per square kilometre = 10 persons per hectare). (Apologies for not having coastlines and for some of the blue labels being difficult to read). There are many more interesting patterns in other cities. 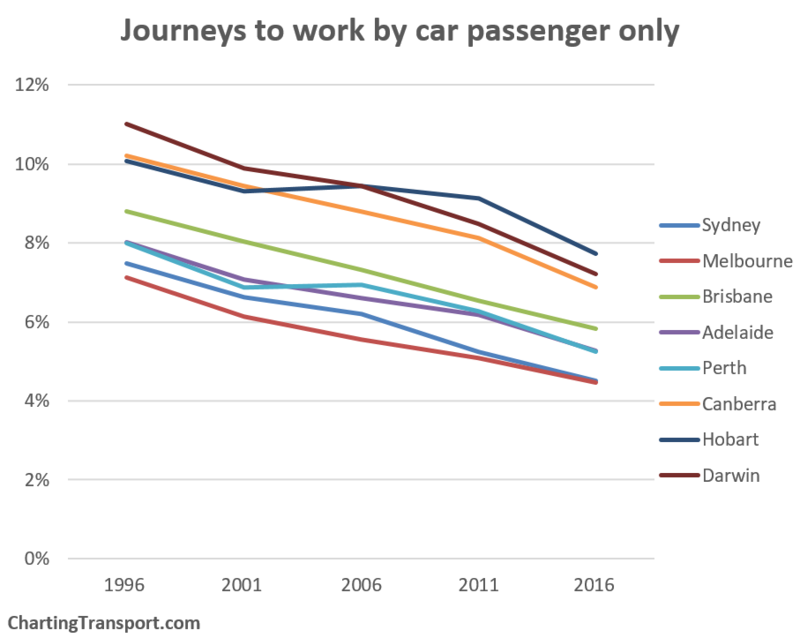 Few people would disagree that higher population densities increase the viability of high frequency public transport services, and enable higher non-car mode shares – all other things being equal. 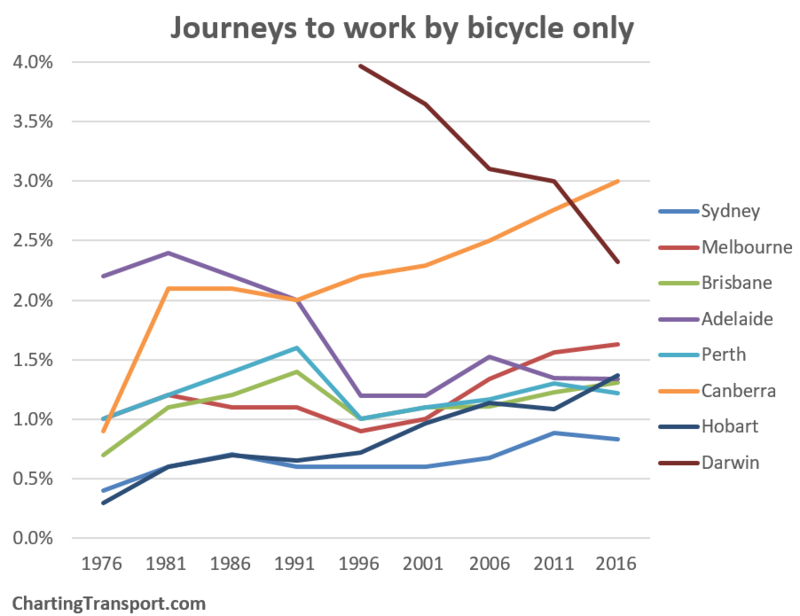 But many (notably including the late Paul Mees) would argue that “density is not destiny” – and that careful design of public and active transport systems is critical to transport outcomes. 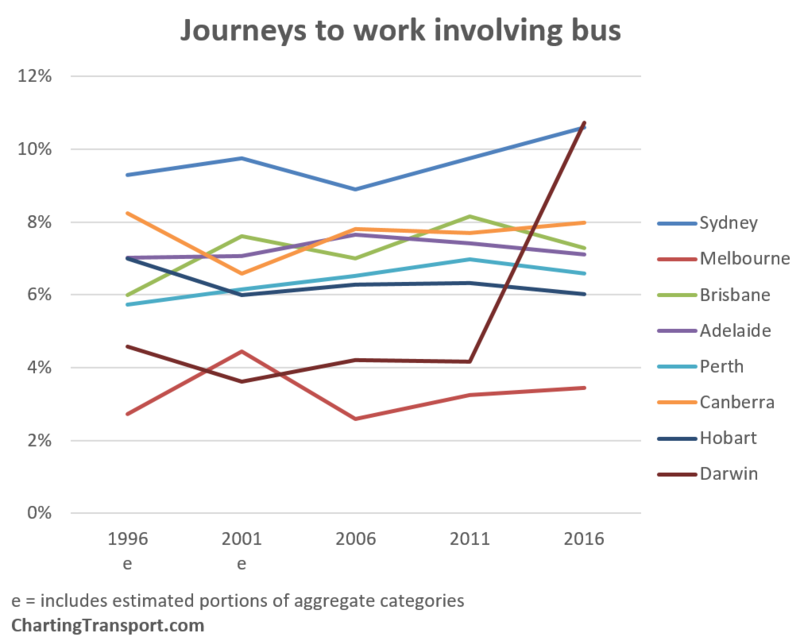 Zurich is a city often lauded for the high quality of its public transport system, and its population weighted density is 51 persons/ha (calculated on the kilometre grid data for a population of 768,000 people) – which is quite low relative to larger European cities. 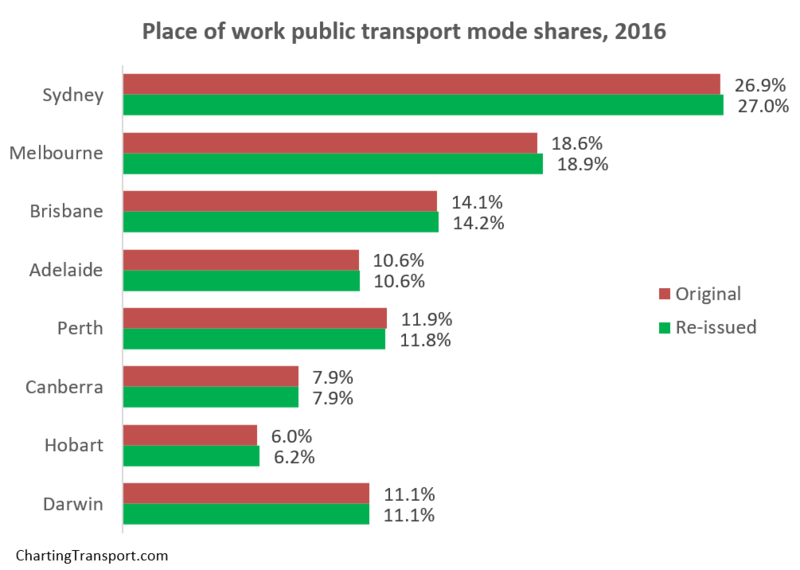 In a future post I’ll look at the relationship between population-weighted density and transport mode shares in European cities. Finally, here is a gallery of grid density maps of all the cities for your perusing pleasure (plus Zurich, plus many smaller neighbouring cities that fit onto the maps). All maps have the same scale and density shading colours. Please note that the New Zealand and Canada maps do not include all nearby urbanised areas. Apologies that the formats are not all identical.